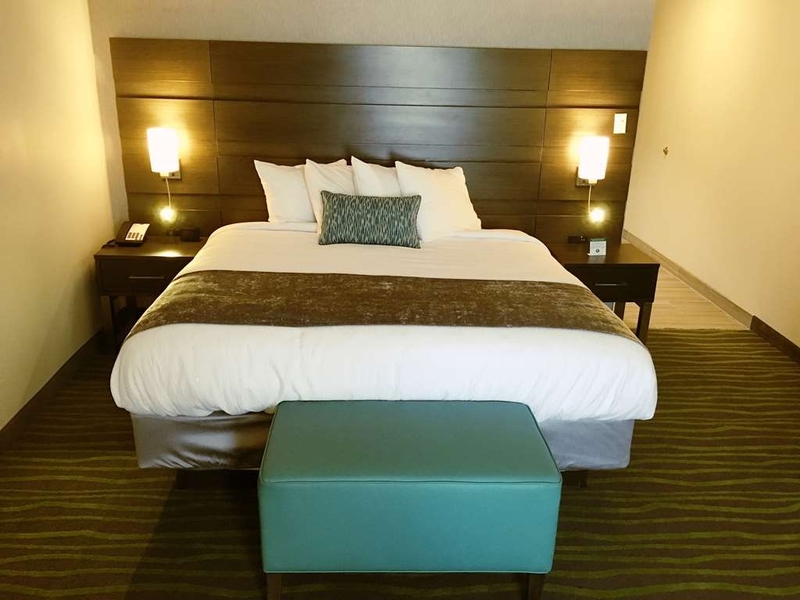 The Best Western Plus Prien Lake Inn & Suites is ideally located in the center of Lake Charles. Come and experience our hotel near the major tourist attractions. Best price guaranteed and exclusive deals. 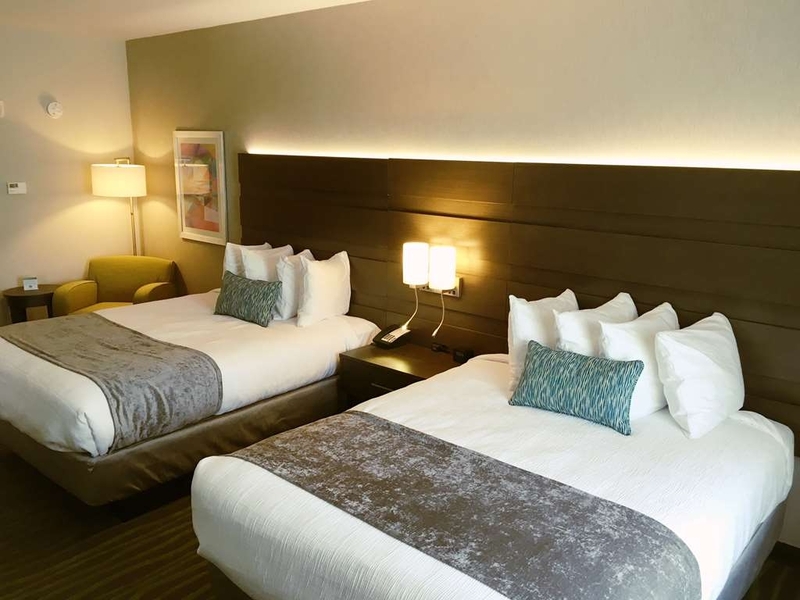 Book your stay at our Best Western Plus® Prien Lake Inn & Suites room today and take advantage of a great deal! 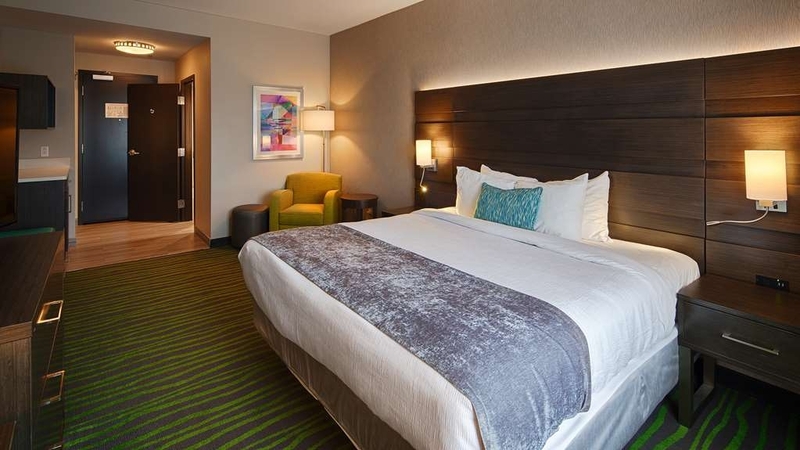 Your Stay at this Lake Charles, Louisiana hotel located only six miles north of Lake Charles Regional Airport. 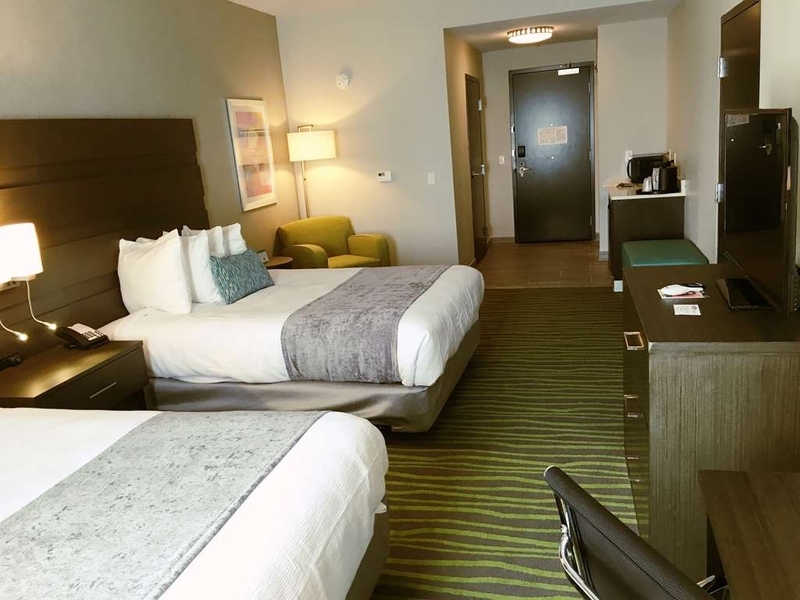 The Best Western Plus Prien Lake Inn & Suites is conveniently located in Lake Charles, Louisiana with easy access to local Sulphur industries, shopping, beaches and Vinton, and Kinder, Lake Charles casinos. Sulphur/Lake Charles provides recreational opportunities such as boating, fishing and swimming. 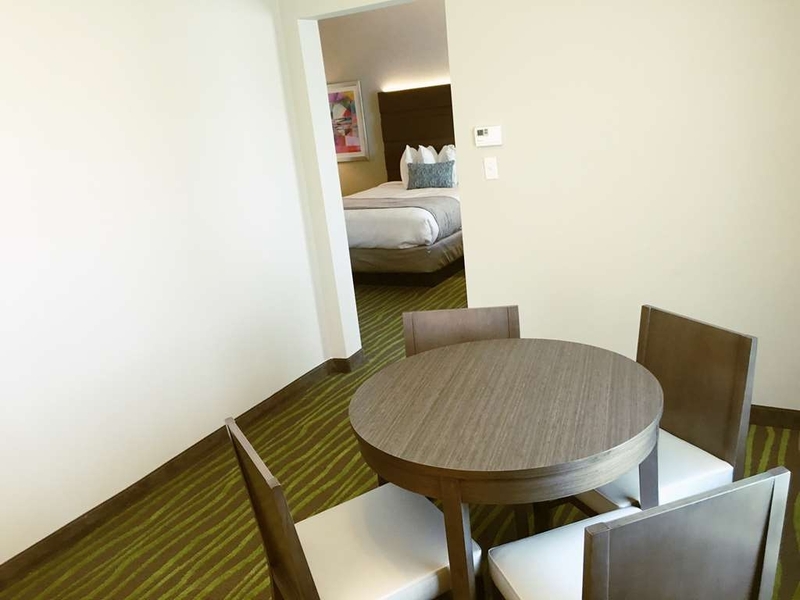 Hotel guests will enjoy the vast variety of area dining. 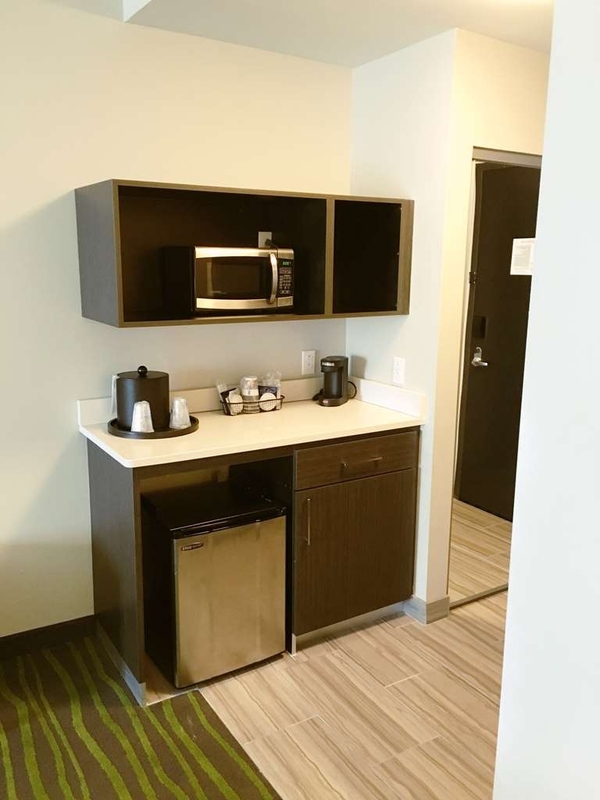 Each spacious, well-appointed room features all the extras that make a big difference while traveling including cable television with HBO®, refrigerator, microwave, coffee or tea maker, iron, ironing board and hair dryer. 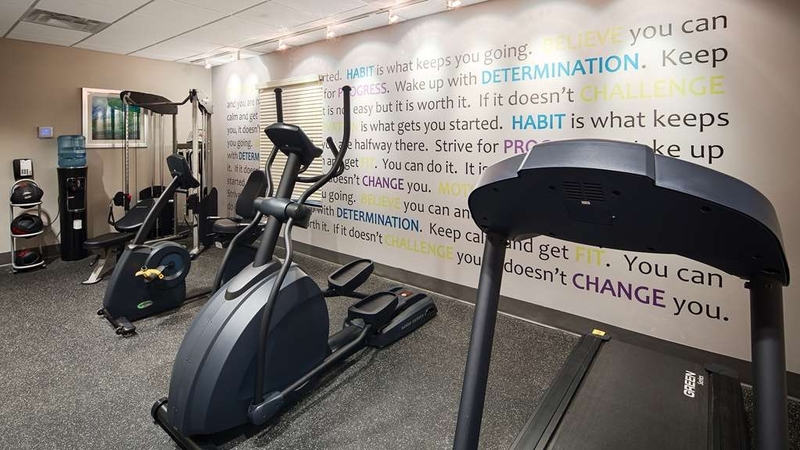 For added comfort and convenience, the Best Western Plus® Prien Lake Inn & Suites offers a fitness center, complimentary hot breakfast, full service business center with free high-speed Internet access and a heated indoor swimming pool. 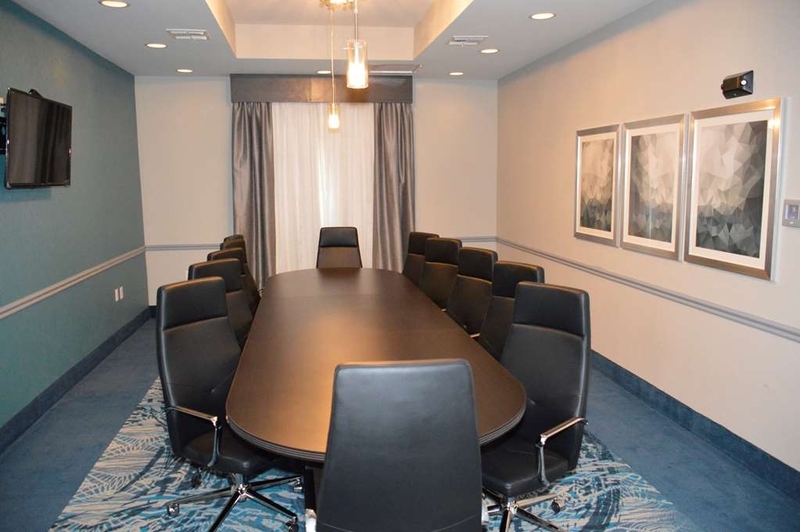 A 12 person Boardroom is available at this Lake Charles hotel for those in need of a small meeting space. 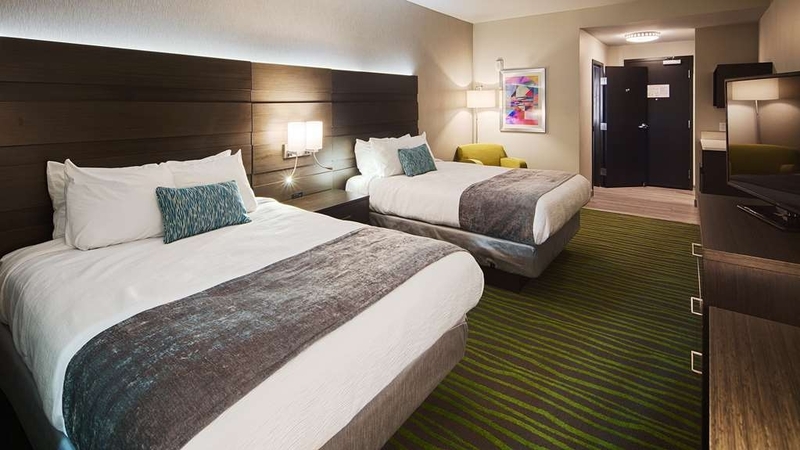 For a relaxed and remarkable stay at a valued rate book your reservation today at the Best Western Plus® Prien Lake Inn & Suites in Lake Charles, Louisiana! Enjoy your stay. The entire staff from is welcoming and also willing to go above and beyond. 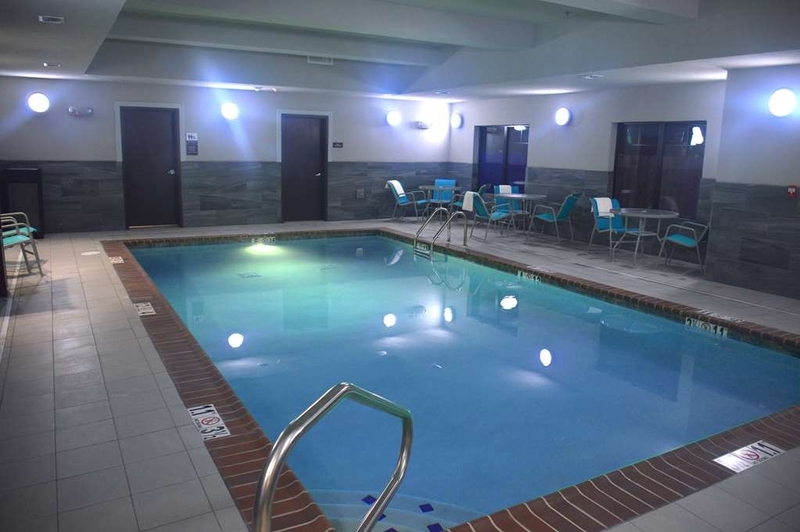 If you are looking for quality, value and relaxation, try this Best Western. I'm never disappointed and always feel like I'm at home. Wonderful to hear, Thanks so much for staying with us again and again! We look forward to your return to our Best Western PLUS Prien Lake Inn & Suites and thank you for recommending our hotel to others. Great to hear! Thanks so much for staying and recommending. This is not a bad hotel, in fact, much of it was up to Best Western standards. BUT housekeeping did a bad job in the bathroom and no one at the front desk much cared. The dirty towels from the last guest had been removed, but I was left with only the presumably clean towels left by the previous guest. There was a used bar of soap in the shower, and only a small bit of toilet paper remaining on the roll. At check-in, I'd asked, as I always do, if there was a little freezer in the fridge. The front desk person assured me that there was. There was not. So I brought my blue freezer things back down to ask the front desk to find freezer space for me. I told her about the condition of the bathroom, and her one response was to tell me that she hoped I would have enough toilet paper. Yikes. Otherwise, it was an average Best Western. I am contemplating changing my major hotel brand to Holiday Inn Express. 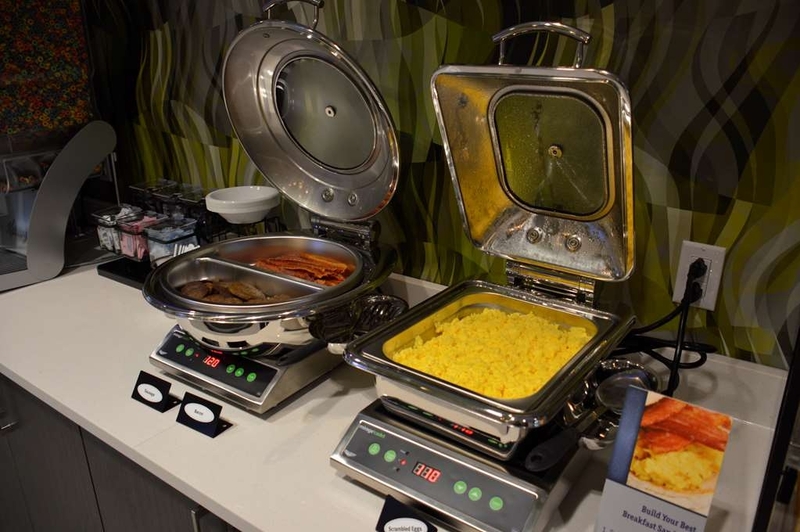 Best Western service seems to be getting weaker, and their breakfasts are relentlessly similar. We are so very sorry to hear of this. Please give our General Manager Kay Fransaw a call on Monday to discuss this matter as this is not customary for our hotel. "Chose wrong hotel in Lake Charles"
Arrived on January 1st, noticed trash cans at entrance were overflowing, and they stayed that way for 2 days. Trash left in the parking lot stayed for days. Dirt tracked on my floor would stay for days without being vacuumed. I worked nights and made an agreement with the manager to get my room cleaned once a week, but that deal was revoked and they said it couldn't be done anymore. I felt that the staff would have had a hard time working at McDonald's much less running a hotel. I'll get a different hotel next time I'm in Lake Charles and I reccomend that you do too. We were greeted by a knowledgeable, friendly, courteous desk clerk who was so helpful. The hotel was beautifully decorated with comfortable beds, a delicious breakfast, and by far, the best customer service I've had in years. Thanks so much for staying with us and for recommending our hotel to others. We appreciate your feedback and look forward to seeing you again soon! Welcome to Louisiana! You know that you are here when you visit this Best Western. The staff is what we call, “good people.” My family and I were treated very well..., from the front desk staff to the room attendants. Everyone reminded me of what the residents of Louisiana is all about. The hotel was clean—from the lobby to my room. The room was very spacious. I had the room with 2 queen beds which also had an extension for dining,office work, etc. The beds were comfortable and the badroom was very clean. Don't forget your swim suits! 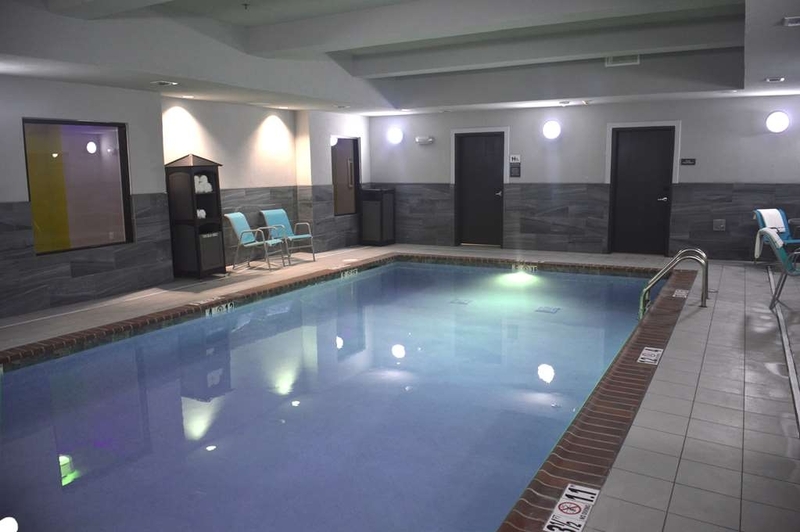 This hotel offers all season swimming with its indoor pool. I chose this hotel because it was very close to the hospital that I needed to visit. Talk about close to things—we were minutes from everything. Casinos, restaurants, grocery stores, and more. I had the privilege of meeting the General Manager (Kay) who was pleaseant to talk to. If you are ever in Lake Charles, LA., I would like to recommend this hotel as I am definitely coming back. Thank you Albert! We love hearing from our guests regarding their pleasant stays at our Best Western PLUS Prien Lake Inn & Suites hotel. We hope we have the opportunity to host you again and again when coming to Lake Charles to visit the hospital or for other reasons. Thanks again and we look forward to your next stay. "Great Hotel close to the Casinos"
We wanted a hotel that was close to the casinos since they were all booked, being a rewards member we selected BW. The check in was fun, we joked about Football we the clerk, the rooms are always so comfortable! As soon as I turned on the shower you could smell the bleach used to clean, and how can you beat the price when you also get a HOT fresh breakfast! 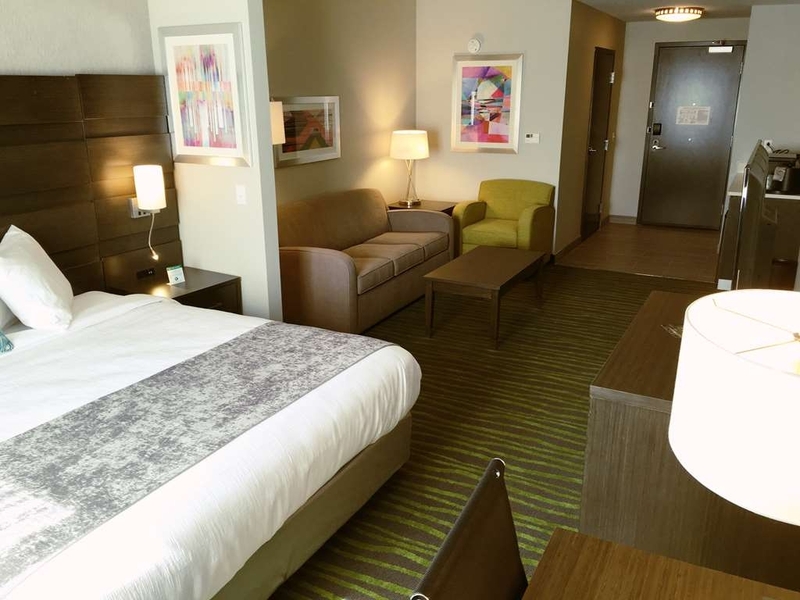 We are so glad to hear that you enjoyed our Best Western PLUS Prien Lake Inn & Suites! We hope that next time you are able to give us an overall score fo 5 when you love the hotel and Hot fresh breakfast so much. Thanks again for staying and reviewing! Refrigerator was wasn't clean, the toilet had to be moved around to get to flush, the heater wouldn't work. The worst was when they were out of breakfast plates. I saw the kitchen worker carrying a small supply of plates and went to her with my hand out so my daughter could eat her waffle. She looked at me and said "I don't have very many" and kept on walking. My daughter and I had been in the breakfast area the longest and been waiting the longest for a plate. I went to the front desk and the supervisor said that the worker was unable to hear. The worker came to the front desk as well and was able to communicate appropriately and lied that she had even seen me (then why did she tell me she didn't have very many??). I finally gave it up to poor service and sat down while my daughters ate their breakfast. I was sitting there without talking to anyone, just waiting for my kiddos to get done so we could get out of there. The kitchen worker again came up to me and basically called me a liar. I told her I know what I saw and heard and I was not going to let her bully me into believing a lie. The front desk attendant came up to me and told that if I didn't stop arguing with her worker (who wouldn't leave me alone) that she would call the police and have ME arrested. I was not yelling or using profanity, just not going to swallow their lies. I spoke with corporate and management and was told they would "investigate and get back to me." This was the first of November and I've not heard back so I called corporate back. They said their records show the hotel had called me and all was better. When I explained I was not satisfied AT ALL, they said they are only mediators and there was nothing further they can do for us. Lesson learned. No further trips will be booked through ANY Best Western. Avoid this place unless you're willing to go to jail when THEIR EMPLOYEES won't leave you alone. Thank you for bringing this to our attention. We are so very sorry for the lack of indifference provided to you by our team and would like to make things better for you. Please give Maureen Brown a call today at the hotel to further discuss. Thank you. We enjoyed our stay at this facility. The room was clean. The air conditioner worked well. We plan on staying here again when we visit Lake Charles. My only complaint is regarding the breakfast buffet. The food and the service was good. But, morning coffee is important to me. The only creamer available for my coffee was “Coffeemate” cups. They ruin a good cup of coffee. There was a carafe of whole milk and 2% milk for cereal and drinking. There is no reason why there couldn't be one for half and half for coffee. This may sound petty, but I do love my morning coffee. Thanks for staying with us Ralph! We enjoy hearing from our guests especially when they have had a good stay with us at the Best Western PLUS Prien Lake Inn & Suites. Do us a favor and the next time you come stay with us at our hotel please state that you would like half and half in your special requests and we will try our best to have some just for you. Best Western has strict standards on what we can have on our breakfast bar but they do not prevent us from taking care of guests special requests. Thanks and we look forward to your return. Everything was wrong from start to finish. Was supposed to be a get away for our anniversary but arrived to inaccurate reservations, spent additional money for additional rooms, staff unfriendly or accommodating. Not happy at all. Thanks for bringing this to our attention at check out we are glad that our General Manager Kay was able to take care of you before leaving our hotel. Thanks again! Upon entering my room I noticed that there were 2 empty aluminum cans in the trash can. There was a sticky residue on the refrigerator. And the bathroom room mirror had streaks. When I returned from dinner, my key did not work. I went back to the front desk and she said that I was supposed to be in another room - problematic as I already unpacked in the room she assigned me when I checked in. She said that another guest was assigned to my room - hence, he entered my room that I had already unpacked in. She said that the guest came back down and said that the room was occupied. The front desk representative did not have an explanation as to how this error occurred or seemed concerned that my privacy was compromised. Thanks for the feedback, please know that we are very sorry to hear that we failed to exceed your expectations and that we are working with our team to ensure that this does not occur again. Please accept our humble apologies. Bed was very comfortable,didn't notice the mold on and in the tub until I got up to shower on check out.Had mold around the bars in tub and no stopper for tub so I used a rag which also had mold after i took it out to drain tub,drain had a lot of hair in it. I will check this out next time,as we just checked in then went out for the night. We are so sorry to hear of this. Please call our General Manager Kay so we can get some more details of your stay and remedy this issue immediately. Thanks for your feedback. I have stayed a many Best Western plus. I found this to be the most relaxing one I have stayed in so far. The staff was very nice and friendly. Very comfortable beds. I plan on staying here in the future. Great to hear! 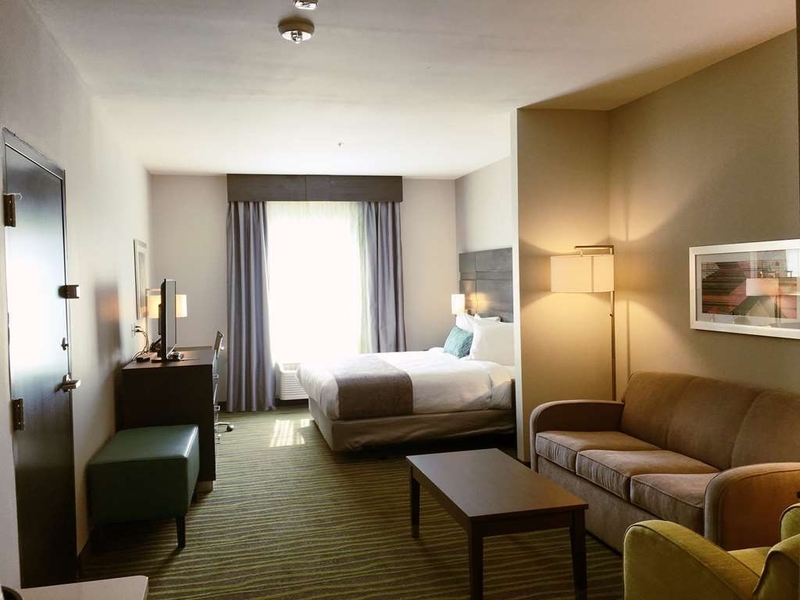 We are delighted that you found our Best Western PLUS Prien Lake Inn & Suites to be so comfortable and relaxing. We hope you will be back real soon. "Worst experience I've ever had"
Hi Garrett! Please accept our apologies for the inconvenience and lack of customer service you experienced at our hotel. We are very sorry and would like to let you know that this team member is no longer on staff at our hotel. Please reach out to our General Manager for further resolution regarding your stay. "Home bound from New Orleans"
Stopped here at 3 AM. The attendant was very helpful and took my “I'm to sleepy for this” attitude very well. Beds were comfortable and rooms were clean. Enjoyed a nice breakfast before heading out at 7 AM. Coffee was good and hot. Creamer was available but they only had one kind. I would suggest a variety such as vanilla Carmel and Irish creme. But over all I have no complaints. Best Western in Lake Charles La. was a nice road break for us. I loved the argan oil shampoos and soaps. Thanks so much for making the decision to stay with us at the Best Western PLUS Prien Lake Inn & Suites! 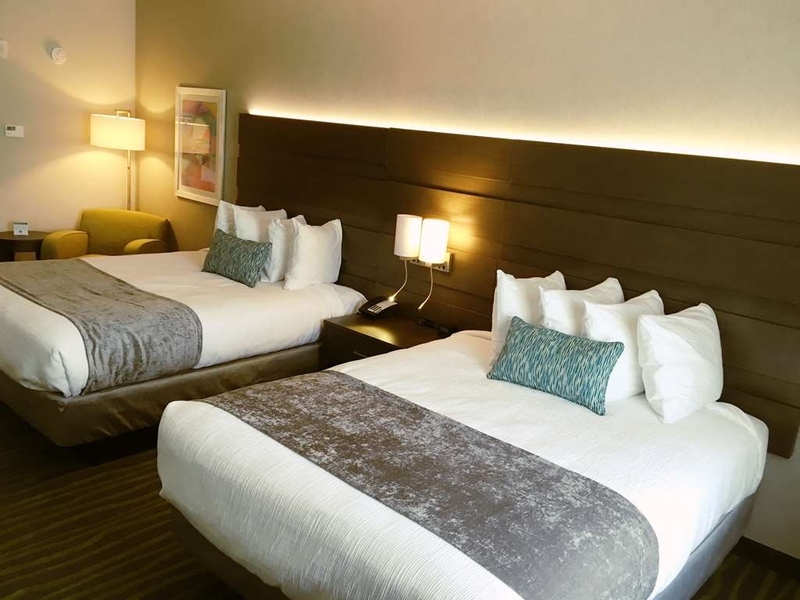 We are delighted to hear that you had a pleasant check-in experience and enjoyed clean and comfortable rooms with a nice breakfast. We will share your suggestion on the creamer variety with the rest of our management team for future decisions. We love the bath amenities provided as well. Safe travels, till next time! "Worst hotel ever. Management would be ashamed, if they showed they cared"
I had tried to contact someone in sales (Marge?) to talk to about a block of rooms for an event. Multiple messages were left and no one called back; when I complained I was told "she is busy". So, I decided to check the place out in person. Check-in took too long, staff was either new (but no one seemed to be training them, so were they really new?) or just lazy. Management didn't care in the morning about my complaints, informed them our group needing 20 rooms for 2 days would go some place else. Was told (and I quote) "that's too small a group for us to bother with, good luck going elsewhere, we own all the best hotels in town". If this is indicative of the "best in town" then I will take our regional meetings to a different town next year. Hopefully for this year, I can find one not owned by this company. "Really nice place for an overnight stay." We were driving through and found this motel and we were very happy we did. The motel had just been remodeled, at least it looked as though it had and everything was nice and clean and comfortable. The rooms were very clean, and had plenty of room. The girl working the desk was very nice and helpful. The only thing that I can say is the breakfast could use some help. Very bland and the food wasn't very hot, more like room temperature, but a lot of places suffer from this so it's not a deal breaker for us. Thank you very much for staying with us, we are sorry that you did not enjoy the complimentary breakfast provided. Thanks for the feedback! The location was perfect. Just off the highway. Looks relatively new. Great front staff check in. Kayla was wonderful for being new on the job. Booked two rooms. Price was right. Used the laundry facilities. They got the job done. we were directed to the Outback Steakhouse for dinner. Would recommend this place. Awesome! We are delighted to hear that you loved the location of our Best Western PLUS Prien Lake Inn & Suites and found the price right. We look forward to your return and Thank you for recommending our Lake Charles hotel to others. Lights go out and no backup comes on. We checked out and the lights are not scheduled to come back on until that afternoon. No breakfast since lights out and nothing was offered to us like cereal or snack items. We are very sorry to hear that your stay was affected by the blackout in our area. Please give us another try in the future. Really nice hotel looks quite new and modern. Free parking and breakfast is included. The breakfast was only a small selection but great for choice considering it was free. The rooms were lovely and clean - didn't look very old not sure when it was last renovated. The hotel is in a quiet area with only a few fast food outlets nearby but it was ideal for us as a stop off from the airport to New Orleans. Thank you for staying with us and telling others all about your stay. 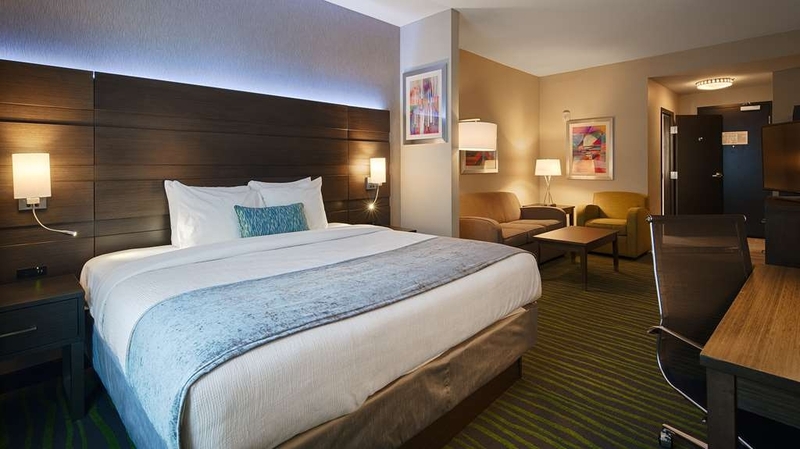 We are happy to say that we will celebrate our Lake Charles hotels' 2nd birthday on April 15. We haven't changed much since our opening nearly two years ago, just keeping things clean and working. Thanks again, and we look forward to welcoming you back to the Best Western PLUS Prien Lake Inn & Suites the next time you are passing through. "Nice Hotel, not the best location"
The hotel was nice, the staff was great. They were kind and helpful. Didn't realize the location is not ideal. The decor was very nice, it looks nice. However, the bed was not comfortable; it was stiff. Thanks for giving us a try, we are sorry that our central location did not meet your taste and you found are beds a bit too stiff. We are glad that you did enjoy everything else. I got a good deal from Booking.com. Very clean hotel, friendly staff. Breakfast was really good. Very organized. TV screen was broken, but was still visible. I didn't make a huge fuss since we were only there for a night. Thank you so much for letting us know about the TV screen. We appreciate your staying and letting others know about your stay. We hope you will stay with us again int he future. Thanks again. This was our first visit to this property, because we finally managed to get a weekend room at a fair price. The hotel registration was quick and easy hotel employees were friendly and efficient. The room was clean as was the bathroom. We did not have any complaints about noise or issues with any of the appliances in the room. The breakfast was above average and the entire breakfast area was clean and well supplied. If given an affordable rate again we would without question stay another night at this property. Thanks so much for staying here with us, we are happy that you took the time to tell others about our hotel. We too hope you will be able to stay with us again in the future. "NICE HOTEL, HORRIBLE CUSTOMER SERVICE"
I planned a first anniversary trip to Lake Charles. 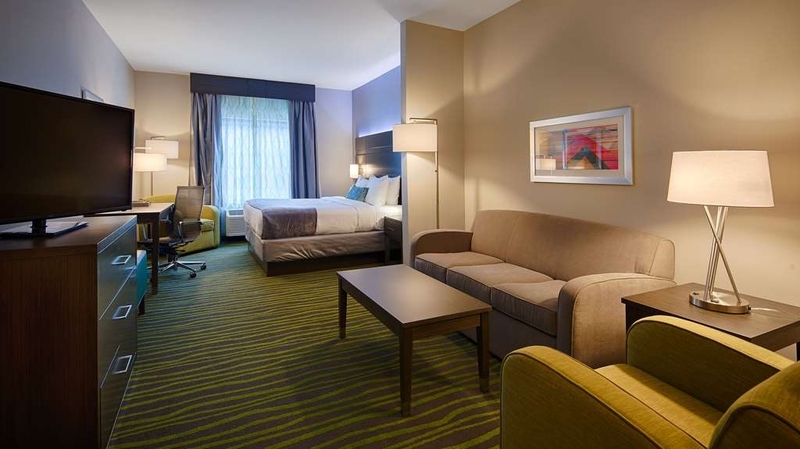 I booked Best Western Plus for Saturday night prior to our check in @ Golden Nugget on Sunday. When I book via Best Western I was told I was given the best rate of $115.00 but it must be pre-pay via credit card. I agreed but on Friday prior to check in I was charged twice, I immediately call & spoke to Kayla she was apologetic & assured me she would release fund immediately. Saturday @ check in I was greeted by "Jordan" I explain the situation from Friday she explain "the funds weren't released & that it was company policy to run credit cards the night before but she would release one stay but she still needed a credit card to charged" I wasn't understanding her process but she develop an attitude, I ask to speak with a manager she explained she was "in charged" & that was I welcome to stay or not. My husband agreed to stay b/c we had already been on the road all day. We checked out Sunday promptly Breakfast was good, despite running out of milk @ 8:30, the hostess return w/ the milk & basically shoved it into my hand "no thanks again". On Tuesday I called to speak w/ Kashonda "general manager" to explain the lack of customer service & the charges. Guess who answers with an attitude "Jordan" & she explain Kashonda was there but she not available "whatever concerns I had she could help"....No thank you. This a casino area with several "new" hotels in the area. This is worst branding of Best Western Plus, Ive ever experienced. Thankful the Golden Nugget stay help redeem our first anniversary! Thank you for staying with us, We appreciate your feedback and please know that this will not be taken lightly and we will address the behavior with both Jordan and Kay. Thanks so much for bringing this to our attention. 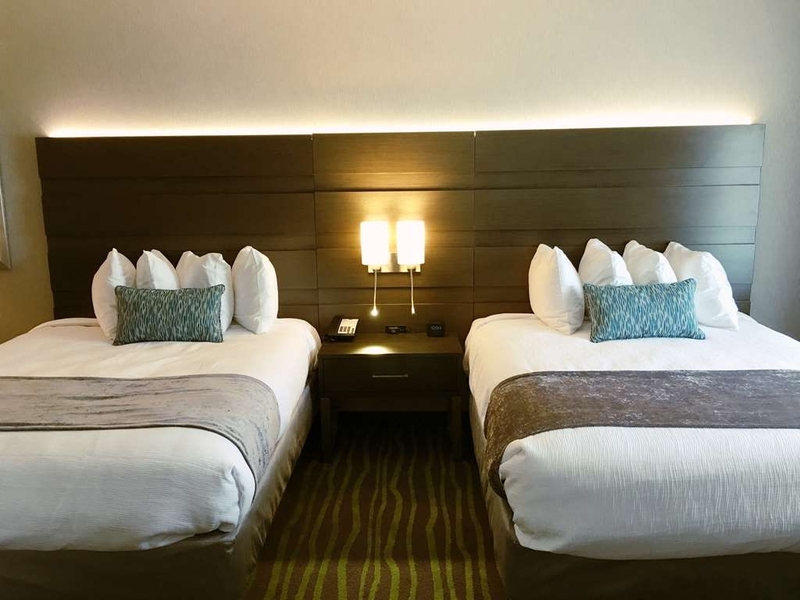 "Large 4 story hotel with lots of parking"
Stayed at Best Western Plus Prien Lake on three different occasions to attend concerts at Golden Nugget. Loved the fact they had a shuttle on weekend nights to the casino. The first stay last year was very nice prompting a second stay. During my second stay I requested extra pillows (they only have 4 tiny pillows on a king bed). I was told that they only had one extra pillow in the hotel. Okay, fair enough. My third stay this month was just awful. I am a Best Western Awards member and also signed up for the $10.00 gift card with each stay, which I did not receive. At check in, I was greeted and told they recognized my name, but I was not greeted as an awards member. No biggie, I figured my gift card would arrive by email later. Upon arriving in our room, I called and requested 4 extra pillows (remember, the pillows are pint size, not even twin size). I was again told there was only one extra pillow in the hotel. Really? Just tell me I can only have one extra! Now the worst part is that I pulled back my covers and there was black spotting all over a portion of the sheet. Really not happy! I don't know what has happened, but sadly this hotel has really gone down. Please accept our humble apologies regarding your stay at our hotel! We strive to provide exceptional service always. We will address the extra pillow situation immediately with our staff and do apologies immensely for your sheets. I will also look into the gift card situation. Thank you for staying and letting us know. "Does not look like a safe location"
We booked on our way in using Expedia this hotel was rated excellent and the price was high so we decided to book. It is a newer hotel the bathroom was not very clean there was a used soap in shower. Getting to the hotel was not right off I-10 it winded around in a neighborhood and business's that looked run down the parking lot seem dark I felt unsafe and was worried my car would get broke into. Thanks for staying with us. 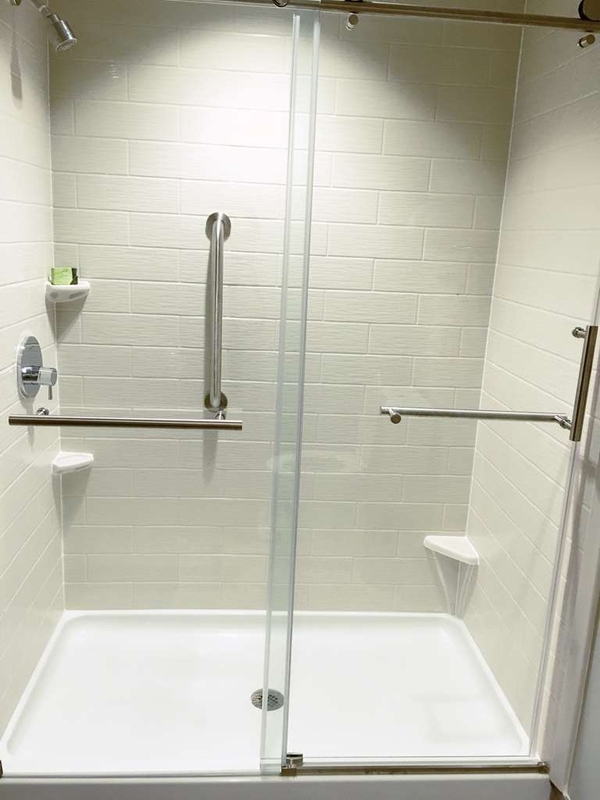 We appreciate your feedback and would like to let you know that we are sorry about the condition of your shower and it has been addressed with the housekeeping team. As far as the rout your gps took to get to our hotel I would interested to know which service provided that map. We have had no safety issues with our guests in the past. Thanks again. 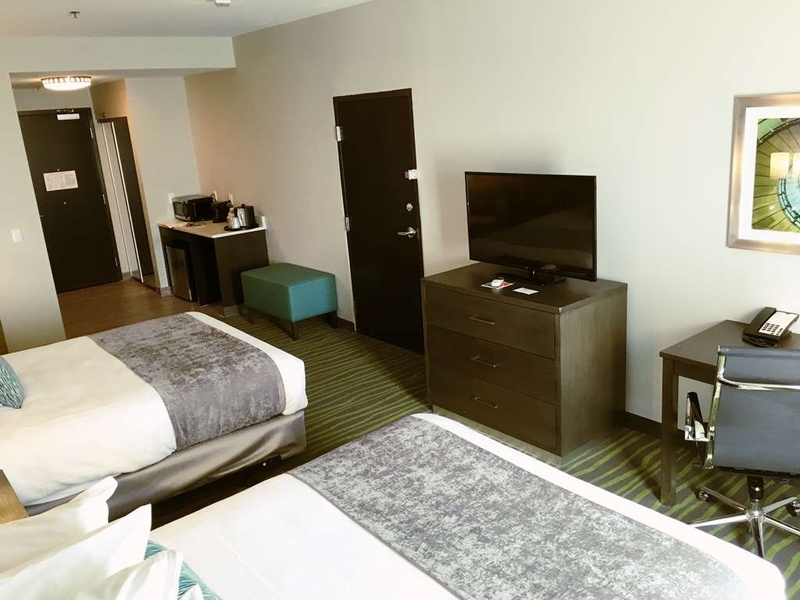 While the Best Western is a little off the beaten path if you're going downtown, it is a good value for the money. It seems a bit outdated but the rooms were clean and breakfast good. It is convenient to the highway. Thank you, I did ask TripAdvisor to remove this review as we are on the main street for Lake Charles and our hotel is new and fresh and hip and modern. Not outdated at all. I truly believe you may have stayed at another Best Western. Thanks for staying Best Western and we wish you safe and happy travels! Best bed ever!! And no night time noise disruptions!! Full free breakfast! New! Clean! Attractive furnishings! Friendly helpful staff! If you need to be in Lake Charles - this is the place to stay! Very conveniently located. Highly recommend! We had a great stay. The hotel was clean and very well maintained. The room was spacious and very modern. 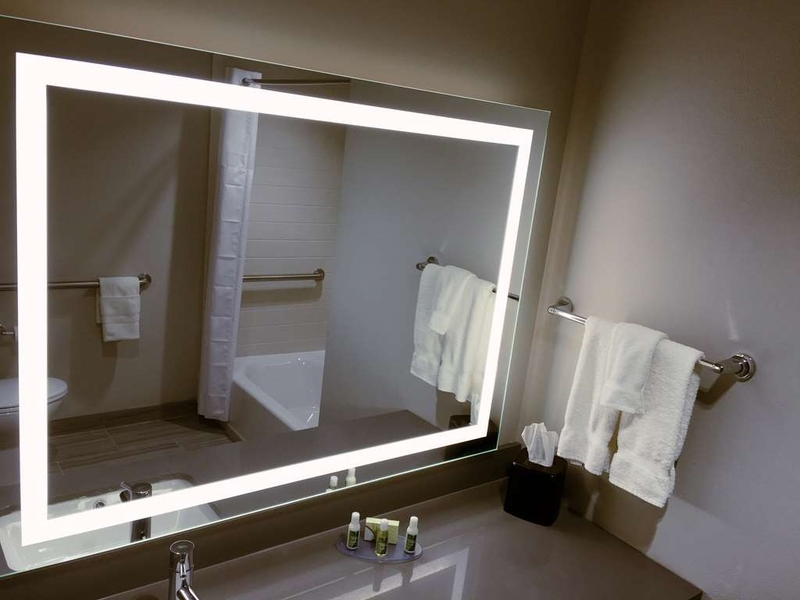 I loved the lighted mirror in the bathroom, very helpful when getting ready for your day. The breakfast was fresh and hot!! Delicious choices like fresh waffles, eggs, bacon and sausage. My family loved it! We will definitely stay here again! The staff at this location is amazing! We had a little trouble with the first room not locking and then were moved to another room and in the morning there was a leak but other than that everything was great!! Ena was amazing! Amazing! Thanks so much for letting us know that you had a good stay sue to our staff even with a few issues. Please know that both of these issues have been taken care of. We are sorry you had to experience them. "Worst experience in many years"
I bought the one night stay at this location. We had spent the weekend in Destin and we're coming back to Houston. We were going to stop in Lake Charles and Gamble. 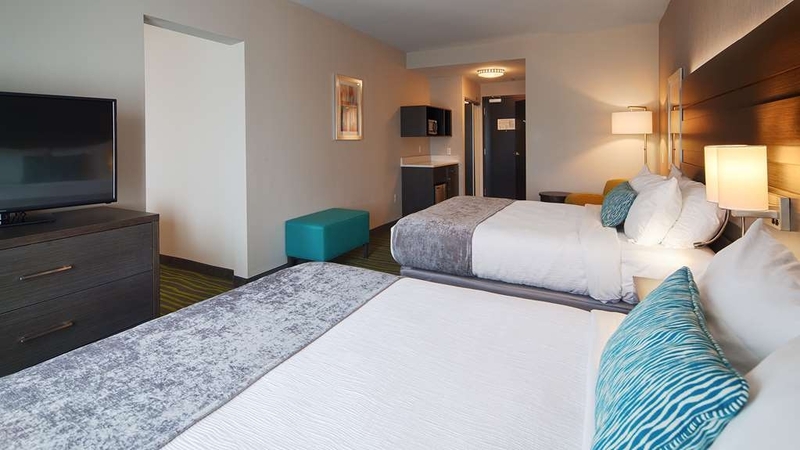 The reservation was made for the wrong night and when we got there they said sorry we can't we're going to charge you anyway but will discount the room $10 on you can go ahead and pay that too. Unbelievable. Went ahead and stayed at the Golden Nugget had a great time. We are sorry to hear of your recent experience at our hotel. Next time please book direct so that we can cancel your advance reservations with no penalty to the hotel from the third party. Very good hotel. Room and premises very Clean, in excellent general condition. Bed confortable bed and pillows options. Breakfast is full of options, good orange juice (not very common). 24 hour coffee and tea. We stay there for a night on the way from Texas to Florida. We are very pleased to hear that you enjoyed our hotel and the amenities we offer to our guests. We look forward to your return in the future when traveling from Florida to Texas. We had a very nice stay. The room was nice and clean. The Staff were very friendly and helpful. The quiet neighborhood was unexpected. The breakfast was nice and hot with a variety of choices to pick from with an ample supply that was restocked constantly. We are looking forward to the next stay. We stopped overnight in Lake Charles at the Best Western Plus Prien Lake. It was well located just a few miles off I-10, and the surrounding area seemed safe. The hotel staff were very professional and helpful, and there were several restaurants near by. We had dinner at Chili's, then decided to visit the Golden Nugget casino which was just a short drive away. We had a good night's sleep, in spite of the bright lighting outside our room's window. Breakfast was ready and waiting the next morning, and we enjoyed a hot meal before checking out and hitting the road. Would definitely stay here again! Thank you for staying with us, and for your understanding and patience during situations that were out of our control. We appreciate your four stars and look forward to your future stays. "Great hotel , I Love it "
Ena is a life saver!! She made me feel welcome and at home during my stay, and she also went above and beyond to give me an incredible room. She really turned an awful week into an amazing one. I can't thank her enough. The property is so beautiful!! If I ever go back to Lake Charles, I will definitely be staying here again!! "Great Night's Sleep at Best Western Plus Lake Charles Inn and Suites"
We stayed for one night at the Best Western Plus Lake Charles Inn & Suites. We had a suite room. The king size bed was very comfortable. The couch, sitting area, and TV was nice. I liked the RCA dog an puppy screen when one signed on to the TV. Internet speed was good. Complementary breakfast is nice with scrambled eggs, cereal, toast and pastries, yogurt, juice, coffee and tea, and more. Service and staff was very nice. I also liked being on the 2nd floor since the laundry is there. The washer/dryer is high quality and able to get laundry done. Parking is free as well. There is an indoor swimming pool. "Looked like a new hotel"
This is a beautiful new hotel with some great features. There are plenty of plugs for computers, and cell phones. The lighted headboards were beautiful. Why don't hotels put in widows that actually open? It would have been nice to have been able to open the window. Although it's beautiful, if I were the owner I would be furious with the building contractor - the fine details showed some pretty poor workmanship and materials, but that's not my problem. Typical breakfast. Friendly staff. Loved this new hotel! So comfortable and clean....Everyone was so nice and helpful. Easy to get to local casinos and restaurants, too. I would definitely recommend booking your stay here in Lake Charles. Thank you for the recommendation and the comments we appreciate you and are very thrilled to know that you enjoy your stays with us! "No cancellation refunds per Owner "
Made reservations for two rooms for September 2 and 3rd to celebrate mother's 89th birthday. Called hotel 4 days ahead to cancel due to Hurricane Harvey (I have telephone record to prove). Was told by woman at hotel that I would receive cancellation confirmation by email (never received) and I also was verbally given two numbers. Still charged for 4 nights. Hotel Manager told me on on September 4th that Owner was not giving any refunds. Best Western Customer Service said they had no legal power to force Owner to do so. 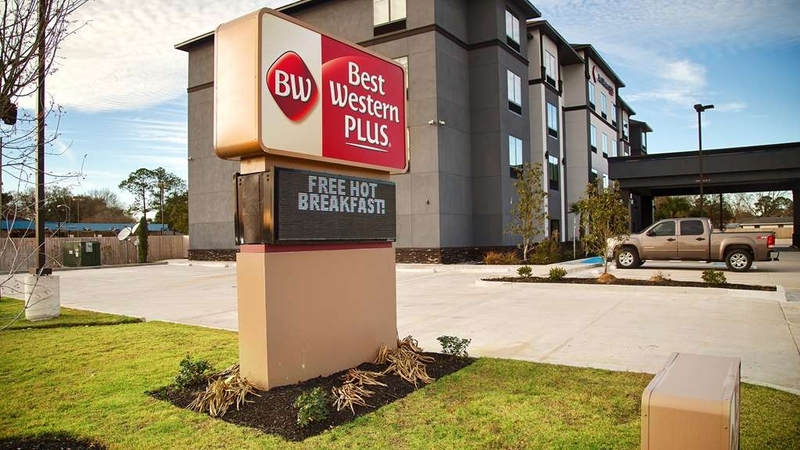 Best Western hotel in Robstown Texas also cited for price gouging during hurricane. So beware of Best Western hotels. Thank you for bringing this to our attention. We are so happy that we were able to get these charges adjusted and waived for you. Please accept our apologies for any inconvenience. We hope that you and your family are okay after the storm, and that when you have travel needs this way you think of us. "Very nice budget hotel. " Very contemporary and clean hotel about 15 months old. Only issue is there is no knob for the shower diverter. They gave me the king room directly across the hall just for the bath. I didn't want to move so I had a king and a queen. Perfect. Will definitely recommend. Thank you very much for your candid feedback. 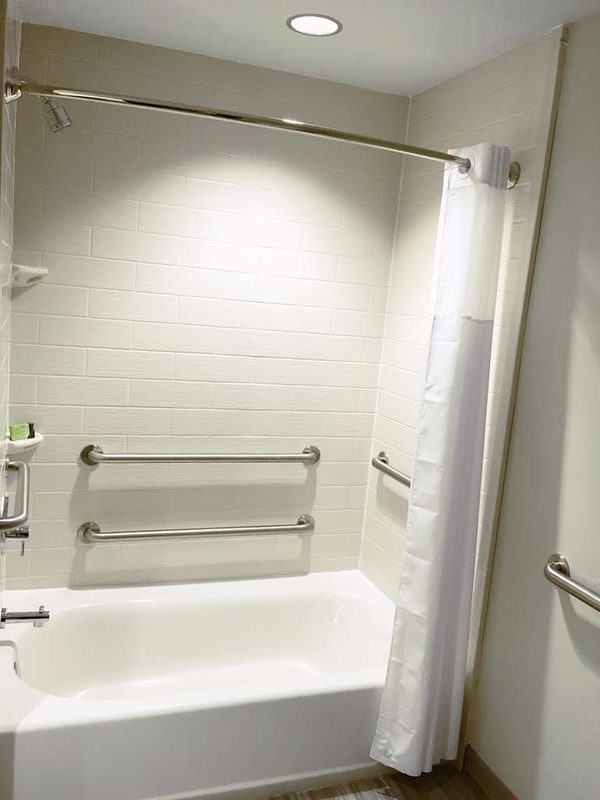 We will make sure to place shower caps in the shower only rooms for future guests as you are correct there are no diverter handles for these walk in showers. Thanks again for staying with us and we look forward to your return! We had a very good experience at this Hotel. The room was very clean. Appeared to be a newer Hotel. The Staff was very helpful. We will most likely stay there again if in the area. they have a pack and play for the babies. We appreciate your review and staying with us, we look forward to your next stay! It was a great stay. I enjoy everything about the room. I have no complainants at all. I will be staying here in the future. The staff was great and very respectful. The food was great and the internet was good. "Stay in Lake Charles La"
We came for a Jehovah's Witness convention and we enjoyed our stay at BW Plus Prien Lake Inn. It's convenient to everything. Very nice accomodations! We will stay there again on our next visit. The only thing I would suggest to the hotel is that the indoor pools water was pretty cold for little ones. Heating it would have been perfect. We didn't use the work out room but it looked very nice also. Thanks for staying and telling others about your stay! We are glad to hear that you enjoyed the hotel and look forward to your return for next year's convention. We have called our vendor for the pool heater as we do have one and it must have gone out. Thanks for letting us know. 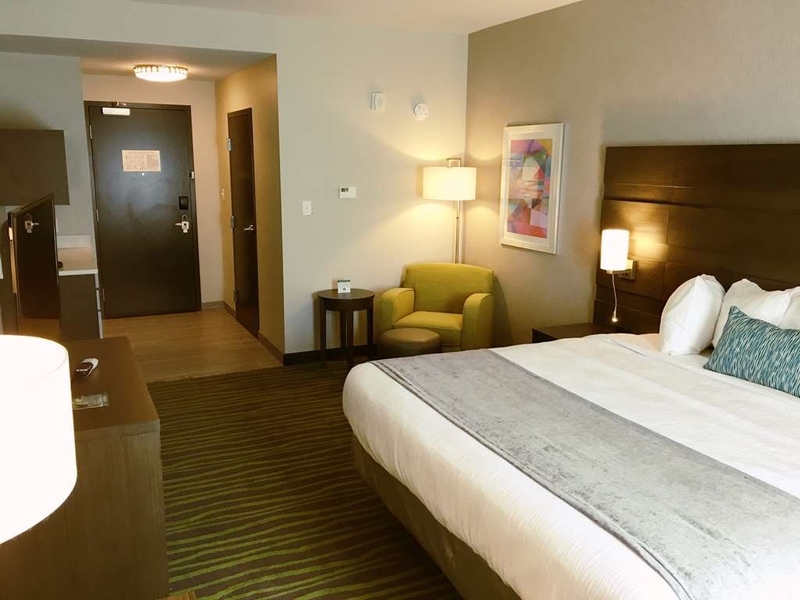 "Overall stay was super. 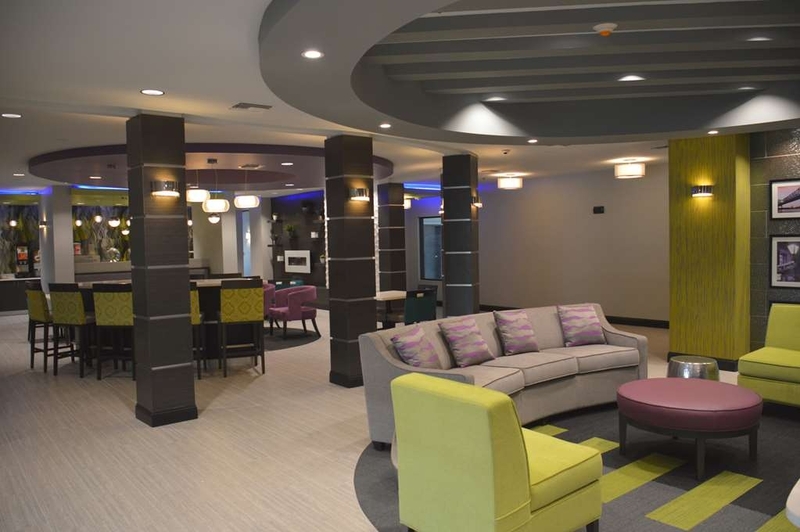 Hotel out ranked the previous Best Western's that I've stayed in." Thank you so much for your kind review we appreciate your comments! 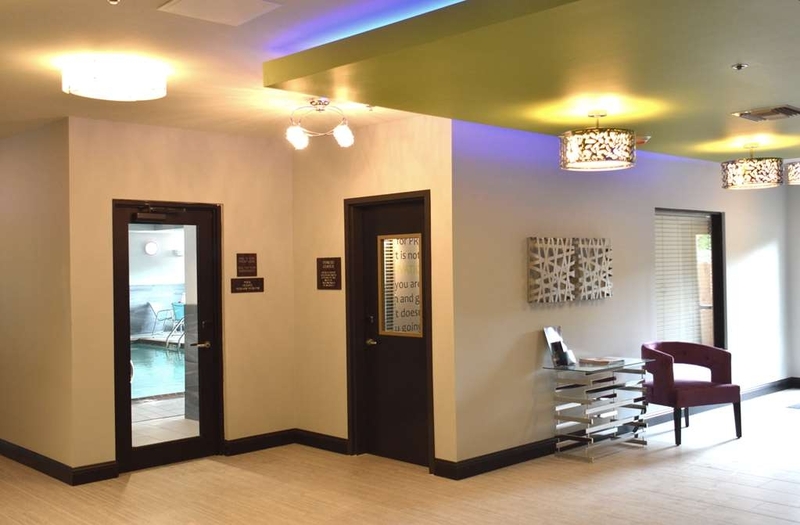 So glad to hear that you enjoyed your stay, the pool, the exercise room, the staff and service you received. We hope that you will come back again for some great southern hospitality at the Best Western PLUS Prien Lake Inn & Suites. 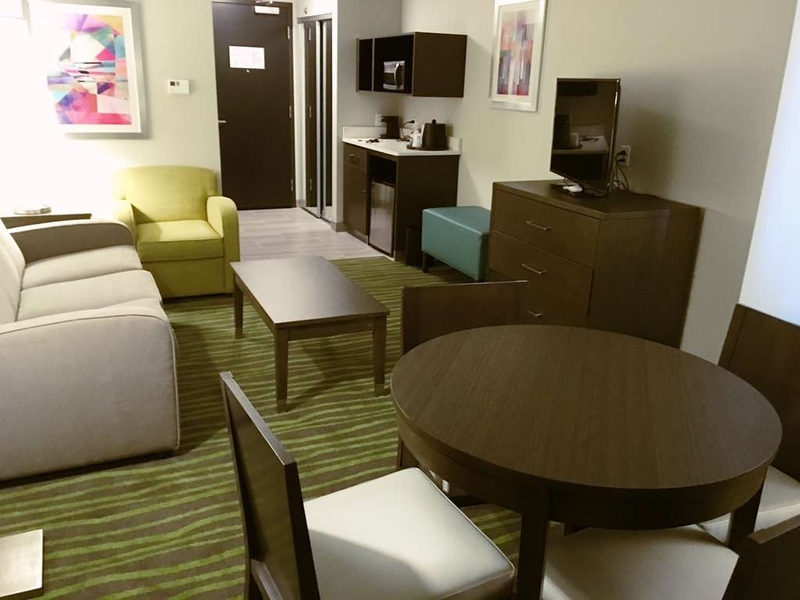 We found the Best Western Plus Prien Lake Inn & Suites in Lake Charles LA to be a far better than average hotel to stay at. 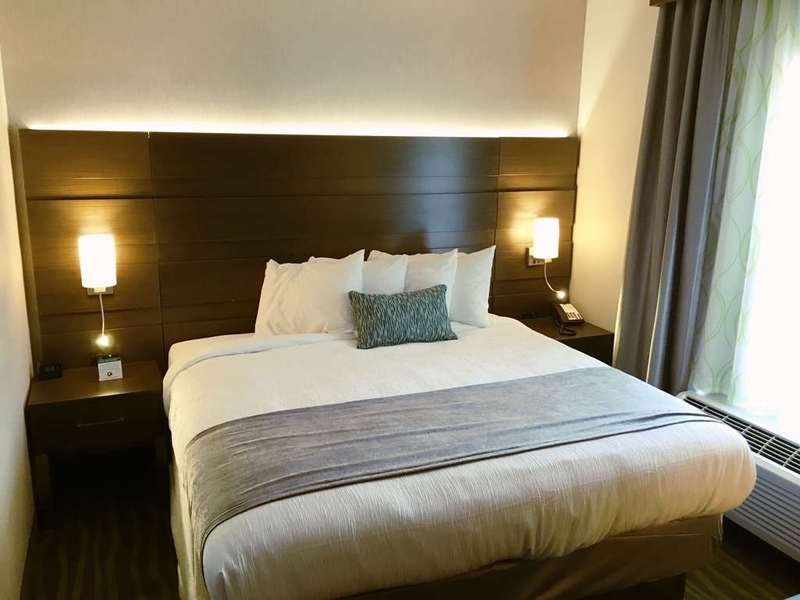 On our trip, we found that it ranked far better than most of the other hotels as far a cleanliness, amenities, staff and accommodations as well as very comfortable rooms. We had a very pleasurable stay there. Thank you so much, we are pleased to hear that you had a very comfortable stay with us and do hope you will return in the future! Thanks for staying with us at the Best Western PLUS Prien Lake Inn & Suites in Lake Charles! We are glad to hear that your enjoyed your stay with us and apologize for any mishap with the towels. Thanks again. "Don't like the weather but LOVE THIS BEST WESTREN!!!" Thanks so much for staying with us! We are happy to hear that you enjoyed your stay and hope you will return in the future for another great stay in a hotel that you love. Only hotel I will stay in during my visits to LC. Clean with a professional staff. Any special request are accommodated and does not have to be asked for a second time. No drama in the hallway or parking lot. AWESOME! So glad to hear it, we look forward to your continued stays with us. This hotel is a bit off the beaten path but a fantastic value. I only urge you to get downstairs by 9:00 am on weekdays as they take away the breakfast at 9:00 sharp. 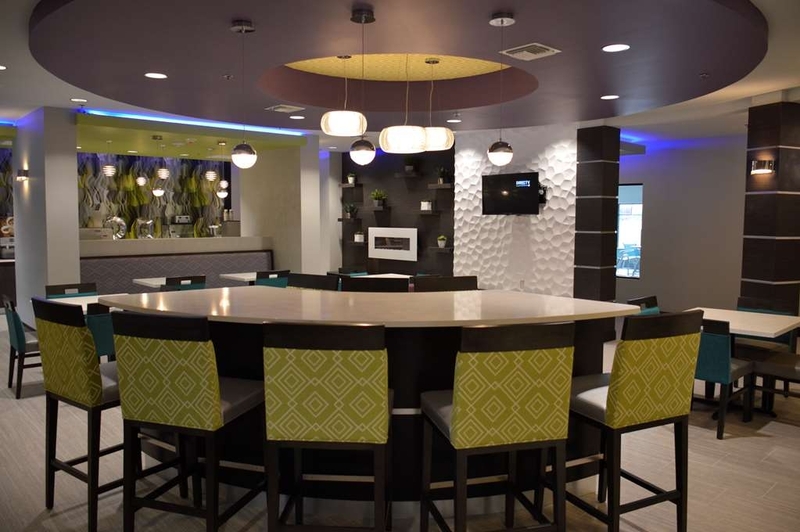 The hotel is new, the staff helpful and their are good places to eat nearby at very reasonable prices. Thanks for staying with us and for giving us a five star review! We are so glad that you find our hotel a fantastic value and the FREE BREAKFAST worth waking up to. Thanks again for staying with us! Beautiful hotel with a modern appearance. every staff member was friendly. Hot breakfast was amazing. best internet service we had on our trip. Fast service! Clean room and comfortable beds. My daughter loved how the staff said yes ma'am and sir. In the north that is not very common. Awesome to hear! Thanks for staying with us and for telling others how much you enjoyed your stay. "Came down for a funeral"
My two sister and I came down to Lake Charles for my Aunt funeral and we stayed @ The Best Western Plus and I was blown away of how nice the hotel was. I stayed in a lot of Best Western Hotel this is the best one yet. I am very well please. All the staff is super nice and they ask u if anything u need to let them know. Front desk call when we got in our room to make sure the room was ok. And we told them that the chair cushion smell real bad and housekeeping came right up and change the cushion for us. I would recommend this Hotel. 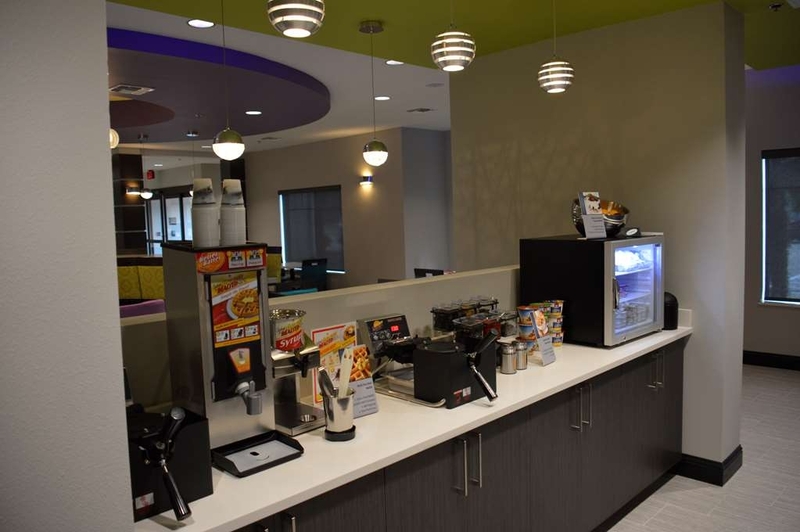 I give a five star rating it is worth the price and their breakfast is soooooo good the breakfast area is very clean you will be very please staying at this Hotel. 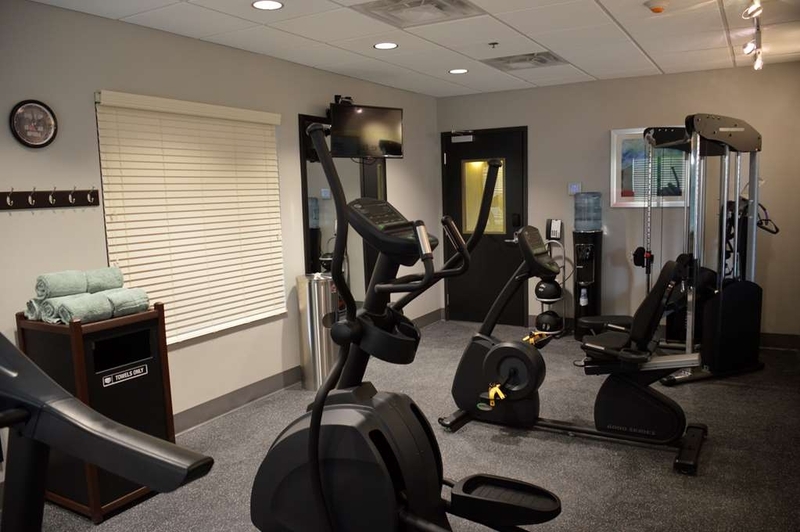 I love the exercise room and they have an inside pool that is warm. Very nice. We are sorry to hear of your Aunt's passing. Thanks for choosing to stay with us and we are glad that we were able to provide you with a pleasurable stay and comfortable experience during your time of loss. We look forward to your return under much more pleasant of circumstances. 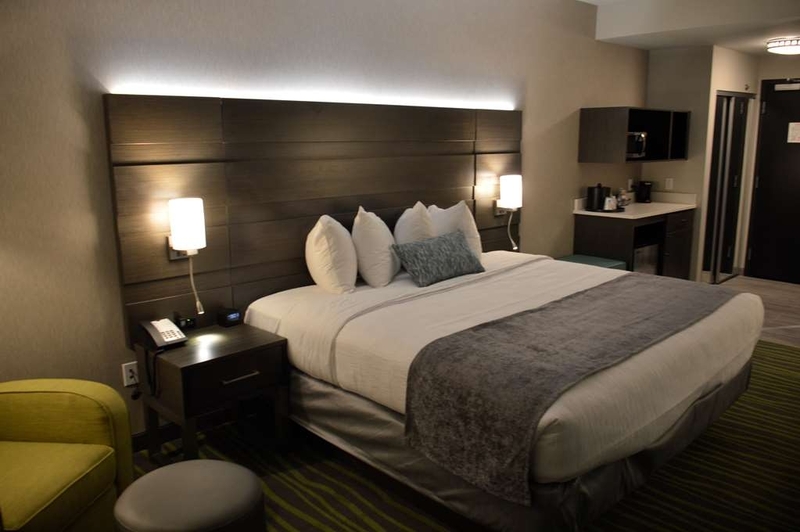 "AN INSIGNIA HOTEL MANAGEMENT HOTEL IN LAKE CHARLES - AVOID STAYING AT ANY OF THEIR HOTELS"
Gorgeous hotel. Horrible service. The front Desk rep, Jordan Fontenot, had a nasty attitude. There was nothing professional about her. The next morning, the housekeepers were banging on all of the doors on my floor at 7:30 in the morning! Who does that?! Then two hours later, another lady comes banging on our doors several times, bothering us again to answer the door while we are trying to get dressed. She kept banging on our door to tell us that she heard about what happened and that the other lady was not supposed to be on “her” floor bothering people so early in the morning. Really? Housekeeper drama…..Wow. The management company, Insignia Hotels, forget about it. They spend all of their time deflecting. They care nothing about how the guests are treated and their business ethics is well below par. Very dirty business. Never again. We sincerely apologize for the behavior of our staff. This is the first I am hearing about the housekeeping issue from you and please know like the front desk issue this will be taken care of immediately. Thank you again for bringing this to our attention. Easy quick check in. The rooms were nice and beds comfortable The Staff was helpful about towels. The location was good in getting to all the ball fields we went to. Breakfast wasn't bad - just tight spot to get to everything. 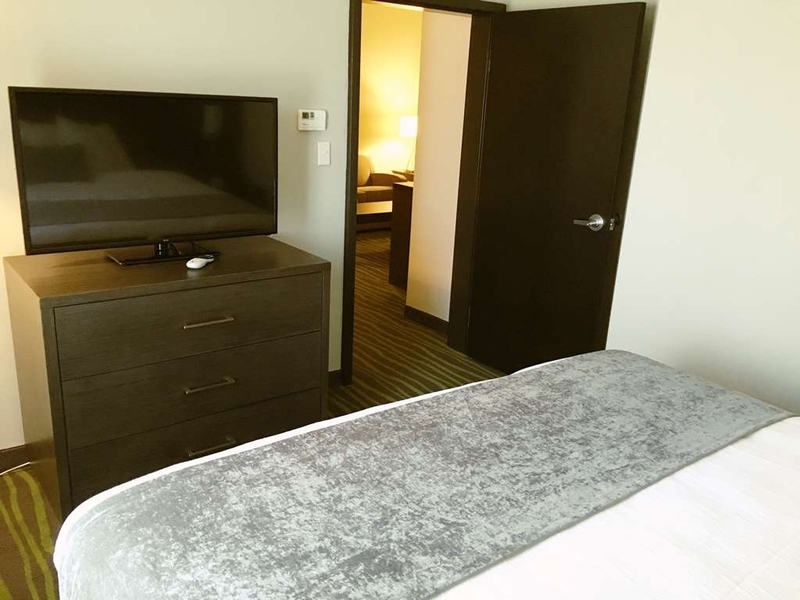 Thank you for staying with us, we are happy to know that you enjoyed your stay and that the location was good for your baseball games. Thanks again! We have been staying frequently at this hotel for the past year. We have never been disappointed. Our room has always been very clean. The staff always makes sure to see if we need anything. Our grandkids love to stay with us when we are in town and they are always greeted like royalty. Jordan and John go above and beyond .. They are two of the reasons we continue to stay there. Kudos to this hotel for being awesome ! 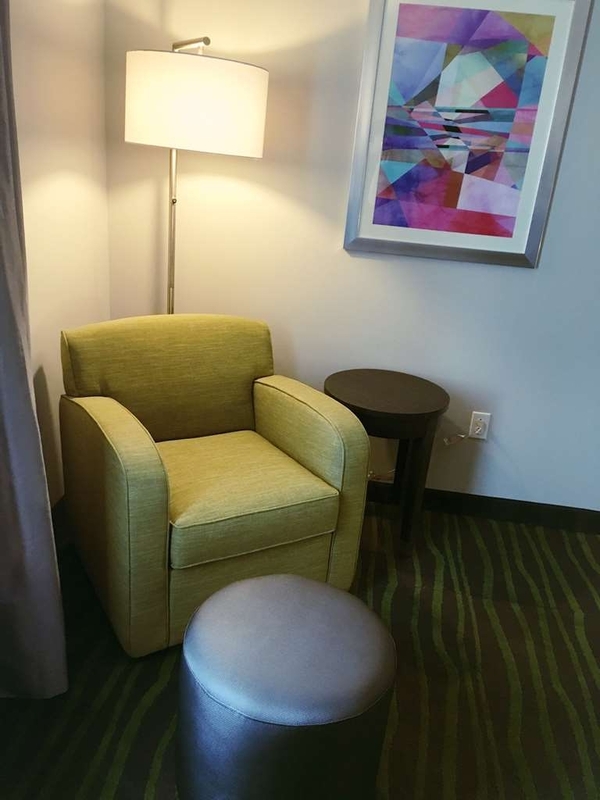 Thank you so much for considering us your home away from home and entrusting us with your visit with your grandkids! We are thrilled to know that you enjoy our hotel and team members so much! We look forward to your continued stays with us. "Decent Accomodations in Prime Location"
Location of the hotel was ideal for our stay. We were in town for a baseball tournament that was hosted at McNeese State and surrounding High School fields. Very basic hot breakfast but what would be expected for this brand. Overall hotels in the area are a bit over priced so the value was what would be expected. Bathroom cleanliness was not perfect, the floor had obviously not been thoroughly cleaned. There was also a funny smell in the room, like there were maybe smokers in there before our stay, but it was not over powering. The guest that checked in before us came back down after going to her room and complained that her room had not been cleaned. 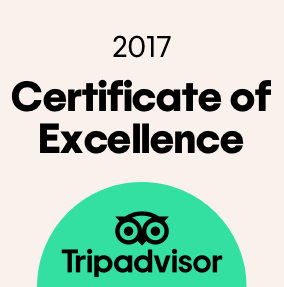 Thank you for staying with us and we are sorry to hear that we failed to exceed your expectations wile staying with us! We hope that you will give us another opportunity to host you in the future. HSKP service is very poor, shower has not been cleaned in two days. Front desk agents doesn't speak to guest. The BKFast agent is the only nice agent. I hate this place!!!! Please run away from this place!!!! it's freshly remodel. Best Western has up there quality in designing the assets. The PIP (property improvement plan) was very much needed. Best Western in Lake Charles, La. this hotel was very nice and clean. The staff was great, very nice and courteous. Continental breakfast was good. Checkout was easy. Parking lot had plenty of space and lighted. 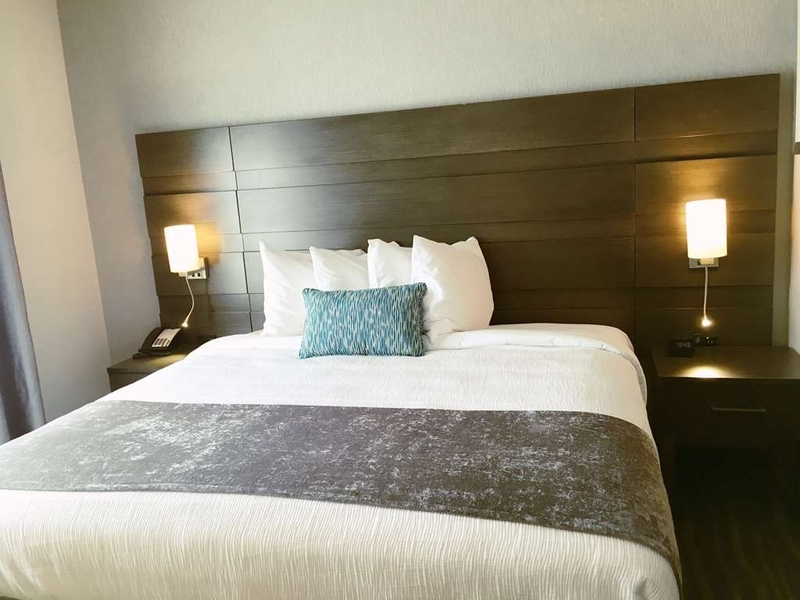 The rooms were comfortable and clean, the staff was amazing!! The owner must be a cheapskate because they have no a/c in the hallways!! Dreadful in Texas!! The breakfast was fresh and hot. It was the usual variety, but good. The desk clerk was very helpful with area directions, and very courteous. All of the staff is wonderful!! Checked in May 27, 2017. We had a great stay. We reserved the room in advance for 1 night only. The room and bathroom was really clean. Nice comfy beds. We stayed on the 4th floor and it was quiet even with kids being at the hotel you couldn't even tell they were there. Breakfast was amazing they had a hot and cold foods and huge waffles and and different drink choices like apple juice, orange juice, coffee, tea, and milk. The pool was very relaxing. When we first checked in we asked them what is in the area that we can do and the check in lady asked if we wanted her to print out different things we can do beside the casino. She was super nice. Staff was very helpful and nice. Overall I would stay there again if we decide to go back to Lake Charles. Our room, (third floor) was dirty the entire time we were there. I cleaned it myself with disinfecting wipes that I bought after seeing the room. The bedside tables had a sticky substance spread around on them. The tub was dirty and had long black hairs in it that did not belong to anyone in our family. The mirror in the bath, and especially on the closet door were extremely dirty with spots and a black substance. I reported it to the front desk the next morning and asked for it to be cleaned well....instead it looked the same except there was a new chocolate chip on the carper....we had eaten nothing with chocolate chips. The deadbolt did not work on the door (the strike plate on the door frame did not match up with the deadbolt). I reported this and when we returned from our day, our door was ajar and the deadbolt was in the "out" position...so anyone could have walked into our room. Thankfully nothing was taken. The front desk clerk when we checked in (Ena) was very pleasant. But the lady that was there the next afternoon and evening was extremely rude and unpleasant. Also-we only got one towel in our dirty room. Had to get others from the front desk both days. Others in our group had the same experience. We had several other families in our group with the same dirty room, not towel experience. Two had to change rooms due to cleanliness issues. We apologize that your team was unhappy at our hotel! Please know that we have taken the necessary steps to reprimand any team members that were involved in the preparation of your room. We are also quite sure that this will not happen again. Thanks again for bringing this to our attention. The eggs were nasty/gross. Bacon soaking in grease. Constantly running out of forks and coffee. TV did not work upon arrival. Screaming children in pool with no adult only hour. No spa. We will not stay there again. We are very sorry to hear that you did not enjoy your stay with us! We will be using your comments to improve our hotel for future guests Thank you! I was very pleased with my entire stay from check -in Ena, did a great job getting me into my room with no questioned asked early check-in ( At no extra cost ). To Check out... Early morning bill was ready as i walked out the door !! My many thanks to the entire staff for a great stay !! 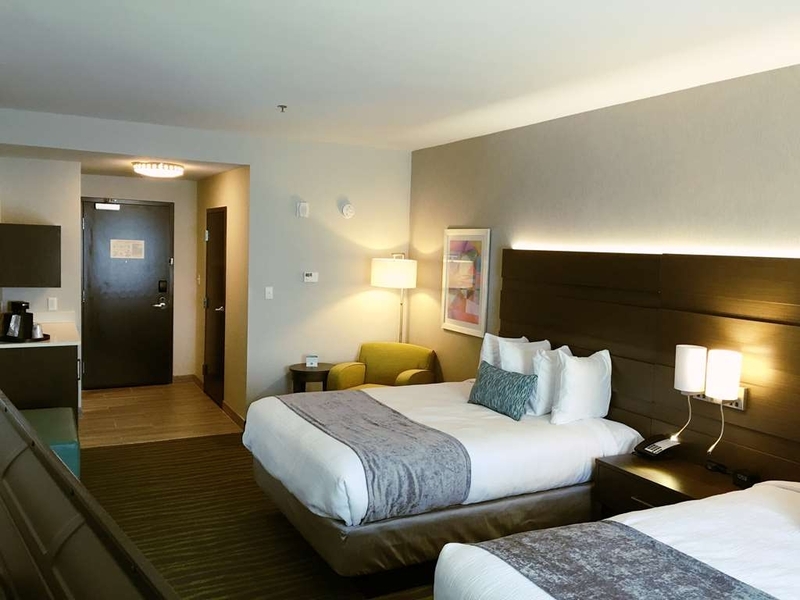 So pleased to hear that you enjoyed your stay with us at the Best Western PLUS Prien Lake Inn & Suites! 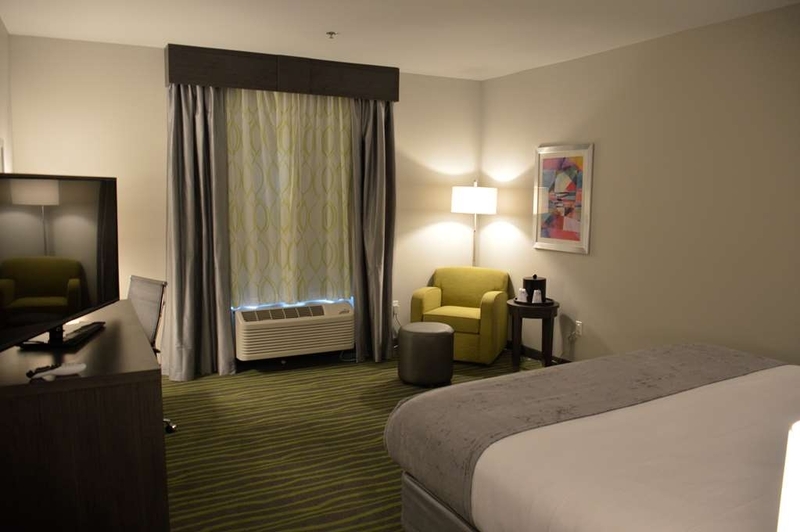 We look forward to your future stay with us when visiting Lake Charles. We are sorry that the satellite TV may have gone out on you. We still feel that it is a better offering to our guests than the cable our area is presented with. Thank you for your feedback regarding the tub we have brought this to the attention of our housekeeping supervisor for immediate removal. Thank you! Stayed for one night while traveling with friends to Texas. This hotel not located near anything in walking distance. There was supposed to be a shuttle to a nearby casino, but we did not use. Bearing in mind that our reservation for 2 rooms was booked and confirmed in February, in the SAME record, requesting rooms next to each other, or at least on the same floor, when we arrived: a) The pair of somewhat surly desk clerks could not FIND our reservation and were attempting to turn us away until I produced a hard copy of our reservation, including the special remarks entry about location of the 2 rooms. b) Magically, we were then welcomed and given rooms on 2 and 4. They said "due to a large group"; however, when we asked if all of the large group had already checked in, the Reservation "issue" was then changed from 4th floor room to down the hall from the other room on 2nd floor. The room was ok, although it did not seem that it had been used in a while, it was musty-smelling. Bed was comfortable enough, plenty of plugs for 2 CPAP machines and charging stations for tablets and phones. Nice, strong shower. Breakfast items included good coffee, thank you, and there were waffles, hot eggs, bacon (greasy), muffins, bagels, toast, cereal and fruit. Pleasant server worked hard to keep it well stocked, as we hit it at busy time. A.M. Front desk staff more friendly than evening. All in all, it was OK for a short stay, but I do recommend you take a copy of your reservation with you. Thank you for staying with us! 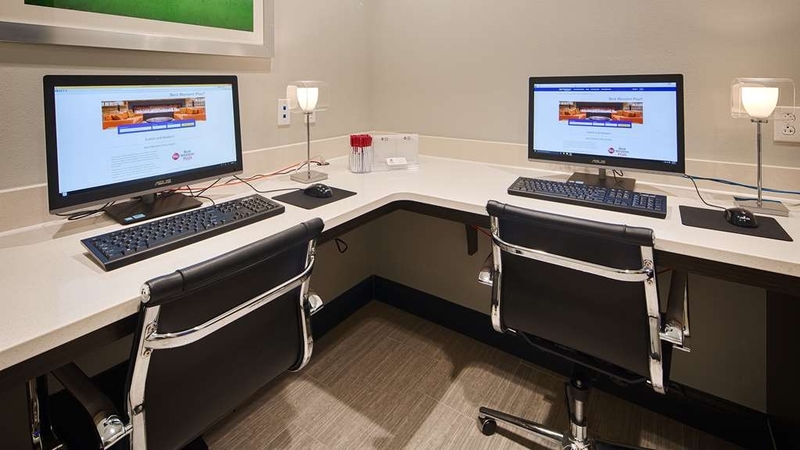 We are sorry for the oversight that occurred at check-in and are happy to hear that they were indeed able to find your reservation and get you on the same floor. Happy to hear that you enjoyed your room, and a good breakfast with good coffee. Thanks again! New hotel and overall a great stay! Staff was super helpful and the beds were comfortable. One block off the highway, but worth it for the good rate and new rooms! Basic breakfast with all the regular things. Thank you for letting others know how comfortable our beds were! We are happy to hear that you found we had a good rate and breakfast. We look forward to your next stay with us. This location is fresh new clean and convenient. The guest services were very friendly entire time!!! 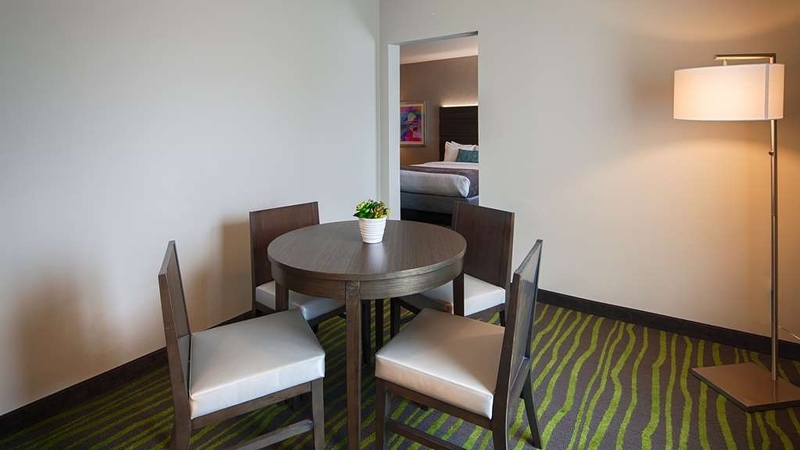 Breakfast was fresh and delicious rooms are clean and spacious and the location was great I near Casino Center. Thank you very much we are glad that you enjoyed your stay with us! We look forward to your return and would like to remind you of our Free Casino Shuttle on Friday and Saturday nights. Thanks again! We stayed for one night while travelling through Louisiana. Our friends accompanying us made the reservations several months ago, but when we arrived, we were initially put on different floors. After our grumbling about it, they did place us on the same floor. The room was clean enough, but nothing special. It had a slightly musty odor, unlike the Libby and elevators that smelled really clean and fresh. Our floor was pretty noisy (second floor). The positive things were lots of plugs for electronics, and a hot powerful shower head. The complimentary breakfast was adequate offering the usual hotel fare. As far as location, it is not near much, although the hotel does offer shuttle service to local casinos. There is no place to sit outside, or to take a walk. I guess they want you to use the indoor pool and workout area, which we did not. Overall, it was OK for an overnighter, but nothing extraordinary. Thanks for the feedback, we are sorry to hear that you found us just ok. Please know that we will keep trying to raise the bar. We were given a room that hadn't been cleaned. There was hair in the sheets, an apple core on the floor, mold around the tub, and a rotten burrito left in the microwave. The drawers had debris left in them. I used a washcloth to clean the surfaces and you could tell the dirt had been there a long time because it was sticky, not just dusty. The next day the housekeeping supervisor came in and the room was cleaned, but not very well. I will never stay in a Best Western again. Please accept our humble apologies for failing to exceed your expectations. 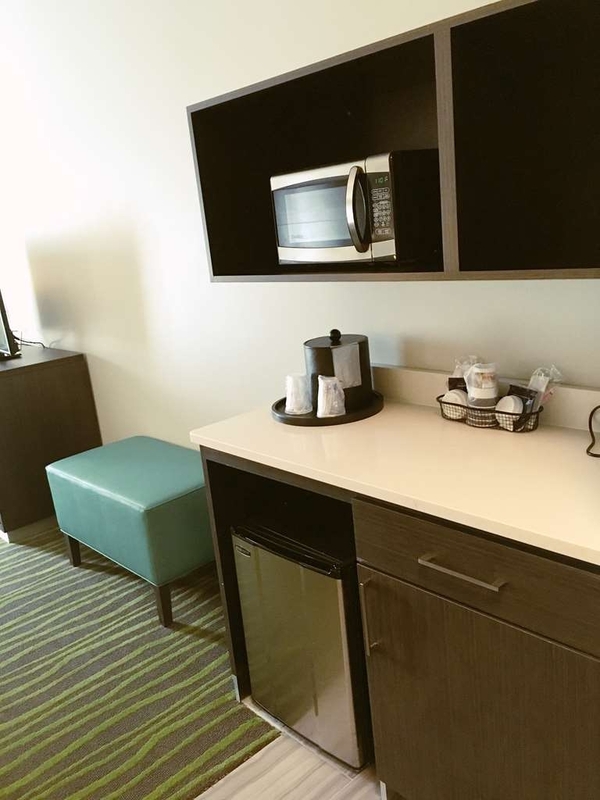 Please contact Kay at 337-477-5900 to further discuss your stay. Thanks! My go-to hotel in the area every time I come here and it never disappoints. The rooms are very spacious and the property is always well maintained. I enjoyed a great workout in the fitness center this morning which really got my day going. 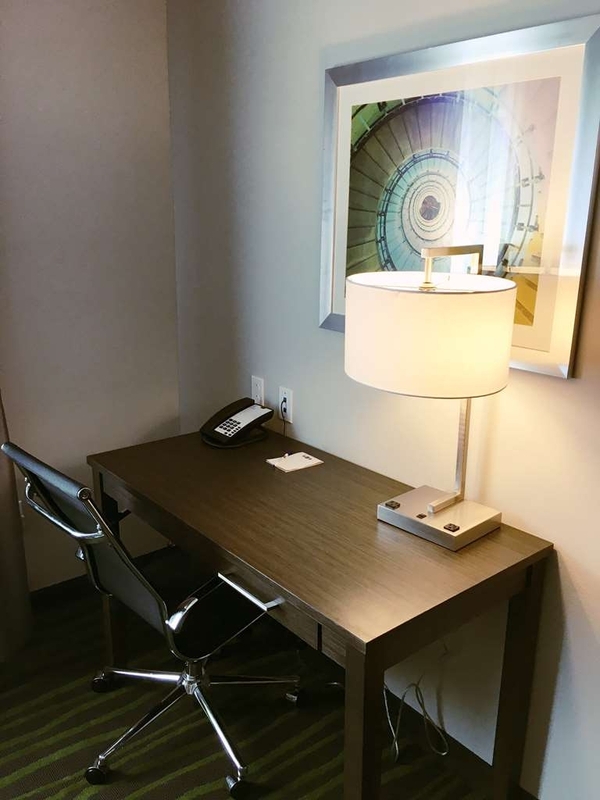 I am able to get a lot of work done here as well because the rooms are so big that I can set up shop and be very productive at the desk area. Very quiet which is also a huge plus. Will be back many many times. Thank you for your kind words and for letting others know what to expect at our hotel! 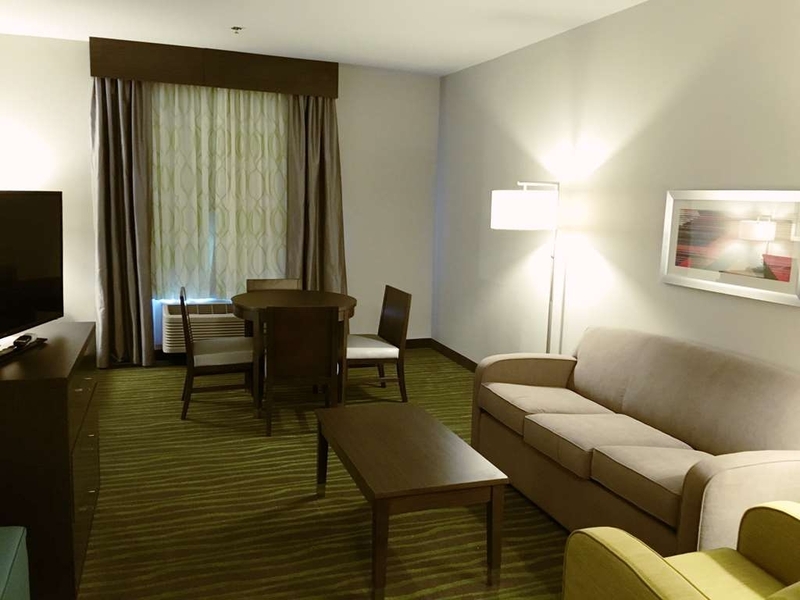 A great room with lots of space that is quiet and includes lots of free amenities. We look forward to your many return visits. Stayed here for family wedding. Called front desk to let them know we would be checking in early, ended up arriving late around 3:30 PM. 2 rooms were ready and the 3rd room wasn't ready till 4:10 PM. That room still had food crumbs on the countertop by the coffee maker and also by the desk. Housekeeping didn't wipe down the counters or the desk. In my bathroom there was mold along the grout line where the tub and tile meet, spraying bleach on it would help clean that up. I did speak to housekeeping mgmt on the condition of the rooms and they thanked me. Front desk staff was friendly, kids loved the indoor pool. Didn't eat the breakfast since we had a brunch to go to. Hotel was busy with a youth baseball tournament in town. We are truly sorry for our lack of attention to the details. We have given your review to upper management for training purposes in hopes that this will never be an issue on the future! Amazing! We love to hear this from our guests. 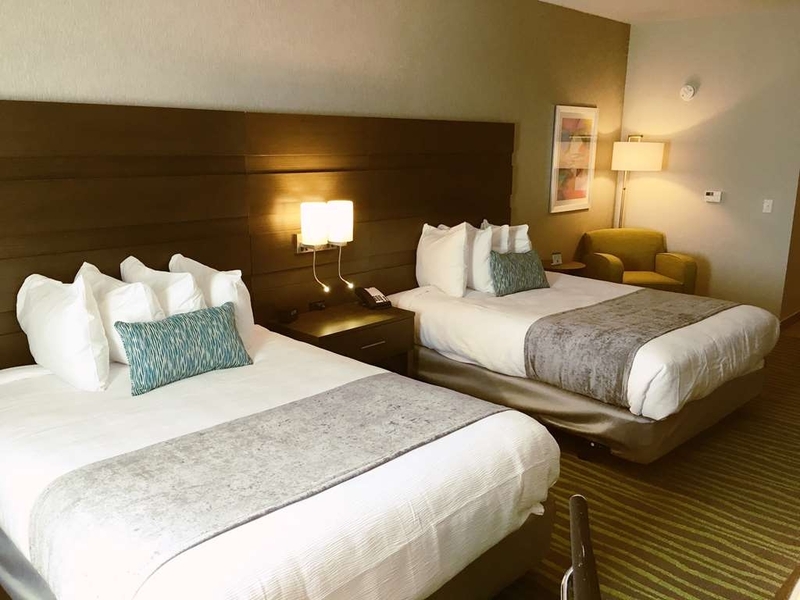 We look forward to your next visit with us, and are super thrilled to know that you consider our Best Western PLUS Prien Lake Inn & Suites a highlight of your trip. Took daughter and a few friends for sweet 16. They loved the indoor pool and breakfast. The rooms were clean but a little dusty. The beds were very comfortable and the rooms were very spacious. I had a king suit and a king room. Thank you for choosing to stay with us! We appreciate your comments and are glad to know that you found our hotel to be clean, spacious with a comfortable bed. Please excuse our oversight with the dust. Booked a room for one night on the 800 #. Requested early check in because we were going to be arriving just after lunch and we had plans for around 1PM. When I went to the front desk no one was there. There was a framed sign stated that they were assisting a guest. I waited 10 minutes and still no one came so I called the # on the sign, the desk phone rang and a man and a woman came out of the office. I asked to check in and the manager told me there were no rooms cleaned yet. I said that I had requested early check in. He said that he might be able to get something in about 1/2 hour. I didn't have the time. I had had a problem checking in to this hotel on another occasion because there were no rooms cleaned well after lunch. I told him that I would be sure to give them a good review on Trip Advisor and walked out. The manager followed me out to my car and stated that he was canceling my reservation. I had not even given him my name yet so we left. I returned later with my reservation confirmation form and gave it to a different person who was at the desk. She stated that here manager had cancelled my reservation because I had caused a scene. I asked how he knew who I was so as to cancel and she said because I had requested early check in so that's how they knew. So obviously I was the only person who had requested early check in for that day and they still did not have any rooms cleaned yet at 12:40 PM. I requested a written confirmation stating that they had cancelled the reservation and not me and the reason why. The manager came and printed out a guest cancellation statement and gave me a hand written note stating that he had refused service to me and he had cancelled the reservation. I thanked them and left. I went a few blocks down the street and checked in to a Comfort in with no problems and with no reservation. The desk clerk was very pleasant and helpful and I go a much better room than I would have at the Best Western. We have family that live in Lake Charles and visit her often. We travel a lot and always try to stay at Best Western hotels when we are on trips. I will never stay at this hotel again. Thanks for your detailed comments, we will use your review as a training opportunity for our staff! We arrived on 3-11-17 for a one night stay, after visiting Golden Nugget. We were welcomed at our check-in by two very considerate front desk clerks. We went up to our room and was very pleased to see a very clean room with lots of space. (Queen/Queen suite) When we got back to the hotel that night, it was very peaceful. 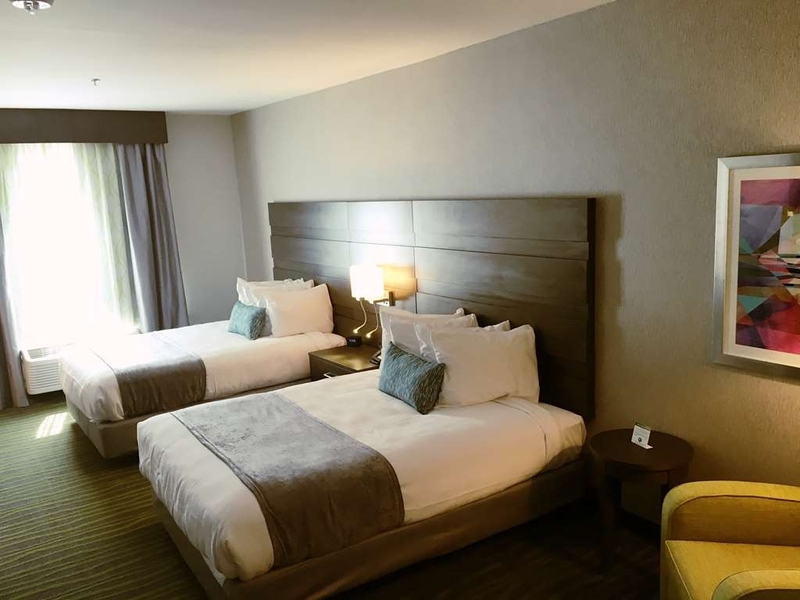 The beds were very comfortable and the restrooms were very nice and clean. We went down for breakfast the next morning and they had eggs, bacon, excellent sausage, waffles, bread, cereal, milk, orange and apple juice and oatmeal with condiments to be added, if needed. We were very impressed by the amount of food available and how they accommodated our individual needs. We will definitely visit this hotel again on our next visit to Golden Nugget. Only 9 minutes (3.9 miles) from the casinos. 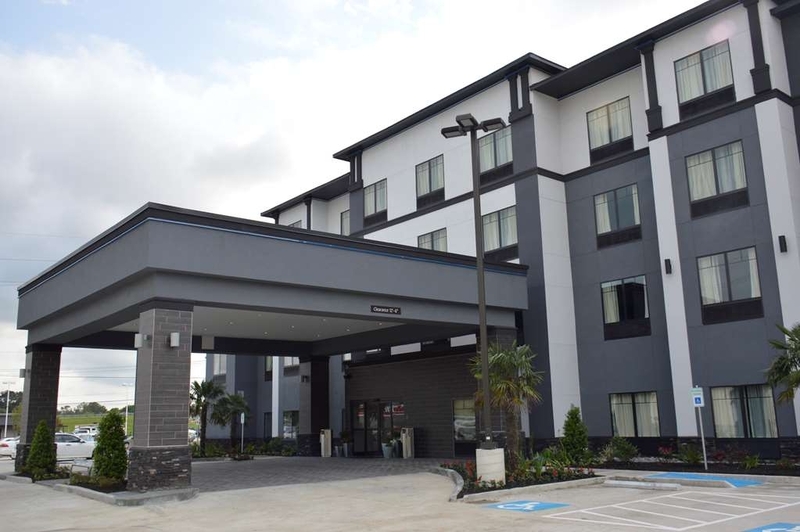 Thank you for staying with us at the Best Western PLUS Prien Lake Inn & Suites! 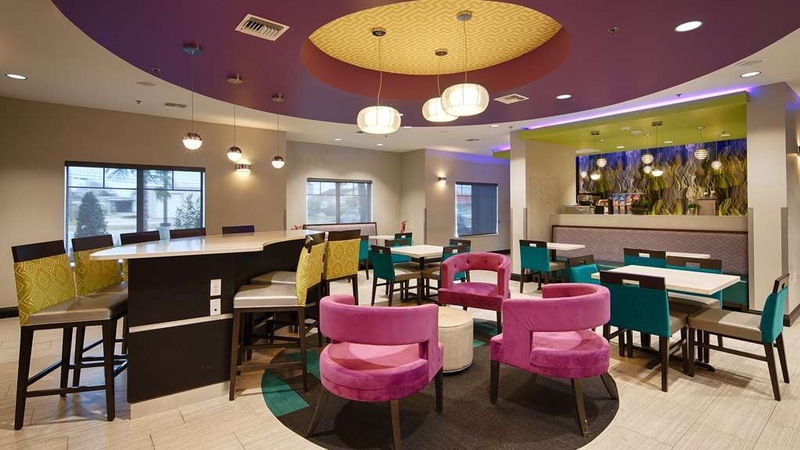 We are happy to hear that you had a great stay with us and enjoyed a good hot breakfast, considerate team members and our hotels proximity to the Golden Nugget. We look forward to your continued returns. Thanks again. While our stay was pleasant, the breakfast was terrible. The bread and biscuits were stale and the coffee was terrible. The rooms were clean and comfortable. The staff was very friendly and helpful when we had questions. Thanks for staying, we have recently change our coffee and feel that you may find it to be better. We will let our breakfast attendant know about the pastries, and bread. Thanks for letting us know. This hotel was by far the best one in lake Charles. Rate was great, along with a welcoming staff! Room quality was great as well, had many features and the colours of the room were very satisfying. The location was the best part, everything was very nearby! "Brand new & ship shape." Just perfect good comfy night sleep. Well decorated, very clean and super comfy king size bed. Good value for your money, stay at Best Western Prien Lake Inn was a much deserved rest after a long trip. "a really nice place to spend the night and some"
The hotel had just opened about 6 months ago. Room was spacious and very clean. Small pool, but nice. Not heated, but was fun for the kids. 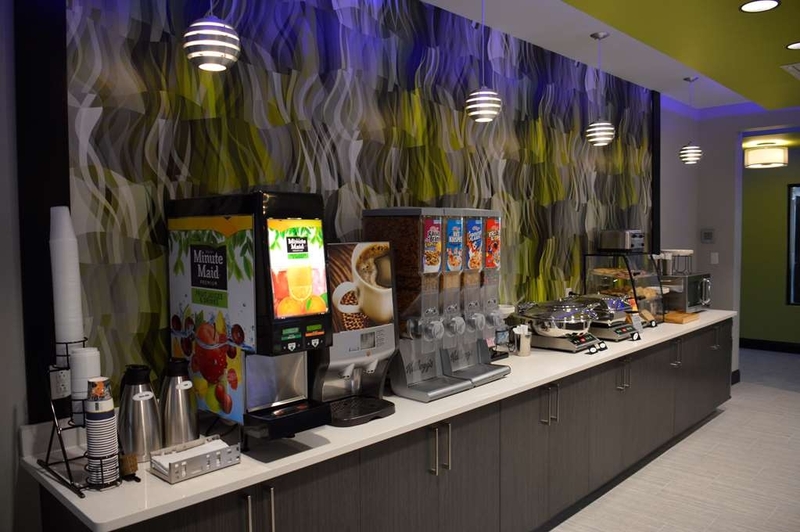 Good continental breakfast, lobby was inviting, and staff was friendly. Stayed here on 2 separate occasions and I would stay here again. 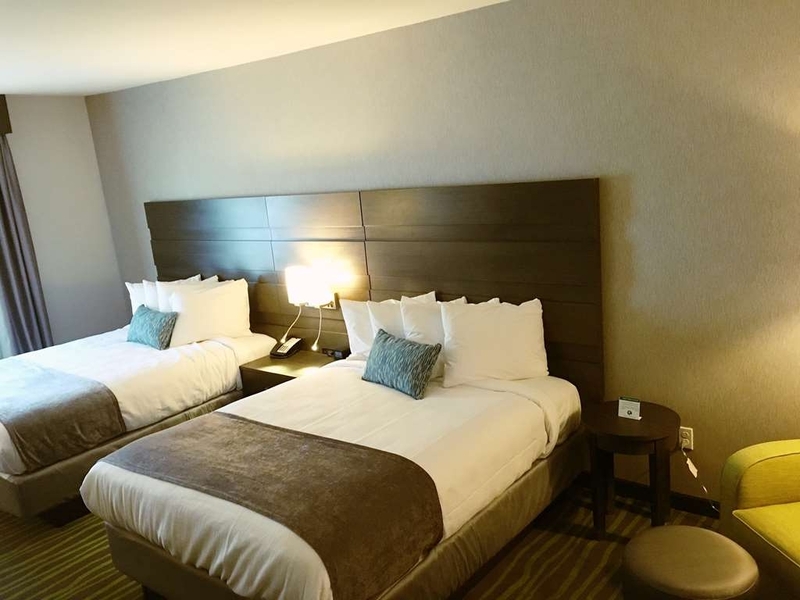 Thanks for staying with us and for letting us know how clean, spacious, and friendly the staff are. We hope you will come back to see us again soon! First time ever in a Best Western Plus. Hotel staff was very friendly and helpful with restaurant recommendations and navigating around the city. Breakfast was very impressive. I did not expect hot food selections plus them being very good. I will choose this hotel when staying in the area for both business and pleasure. Nice of you to tell others how accommodating, friendly, and good our hotel and staff were during your stay. We look forward to your return. All of the staff was absolutely great! During my stay, I was welcomed by the manager. She had wonderful customer service and made me super excited about the stay. That night, I wanted to use the computer and one of the gentleman working the night shift took time out of his schedule to make sure I understood how to use everything. During my check out, I had a great conversation and left not just being refreshed but with new ideas for hair styles and products. I wish I remembered all of the names of the beautiful people who made my stay amazing but nevertheless, I would recommend this hotel to anyone and everyone! I enjoyed it so much, I already booked another stay. Thank you to the staff and many blessings to you all. Thanks for staying with us and for leaving a detailed review of your stay. We are thrilled to hear how much you enjoyed your stay. We look forward to your continued stays. Great Stay. Very Clean and Comfortable. The breakfast was good and hot, but the kitchen space was very small and guests were bumping into each other. The outside of the hotel is dark and kind of out of the way of the main streets. 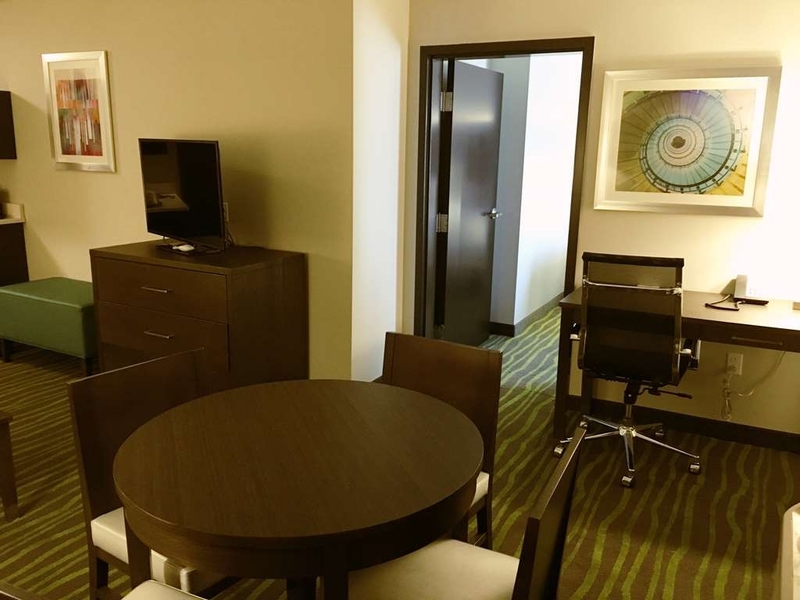 Thank you for your review and for being our guest! We are happy to know that you found the hotel very clean and comfortable with a good and hot breakfast. We look forward to your return. Stayed here for 2 nights very clean, good breakfast, good Wi-Fi, easy parking and it has a lift. Indoor pool was nice and had a good nights sleep. Once you join the rewards programme the rooms come out a little bit cheaper....sometimes. Thanks you for taking the time out of your day to leave us a kind review. Thank you for staying with us and we hope you will return again soon. Rooms new and clean. Very affordable. Beds are comfortable. Staff is friendly. They have an indoor pool and exercise room. Breakfast is good. No complaints on anything here. We would definitely stay here again! We are very happy that you enjoyed your stay with us the Best Western PLUS Prien Lake Inn & Suites! We look forward to you staying again. A wonderful hotel. Modern, up to date and comfortable. 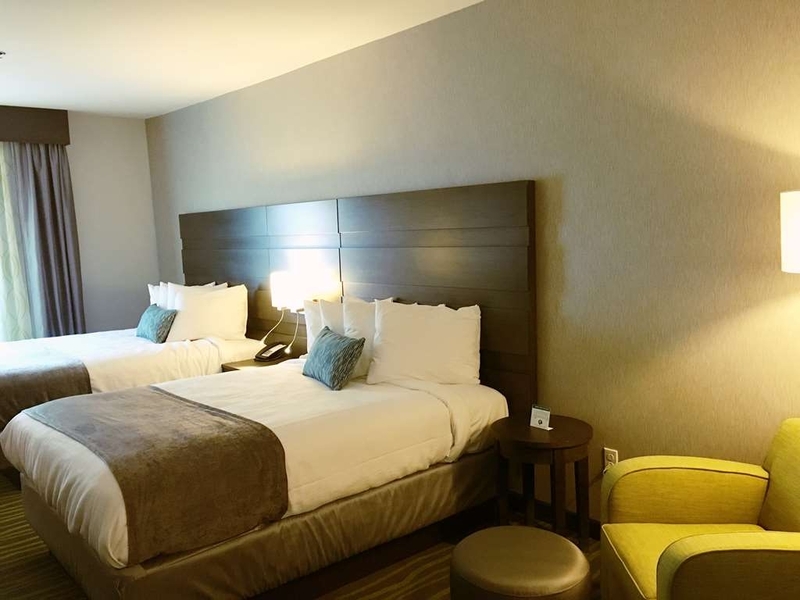 The staff was very friendly and the rooms were VERY clean. Not your typical Best Western. The casino's a not far away. My husband and I will stray there again. Awesome we look forward to your return! Check out our free casino shuttle on Friday and Saturday nights running from our Prien Lake hotels to the Golden Nugget and L'auberge Casinos from 5pm-2am both nights. Thanks again for letting others know how clean and modern our hotel is with friendly staff. We appreciate you, Midge. "Rates High for one night but great hotel & staff"
Thought the price per night was too high to check in at 4:00 and check out the next day by 11:00. Not even 24 hours for $143.00 per night. The hotel was extremely nice as well as the staff. Loved the lighted mirror in the bathroom. They need to add a mirror of some sort in the room too. Thank you for the great hospitality and service. Hotel was brand new and the service was wonderful. 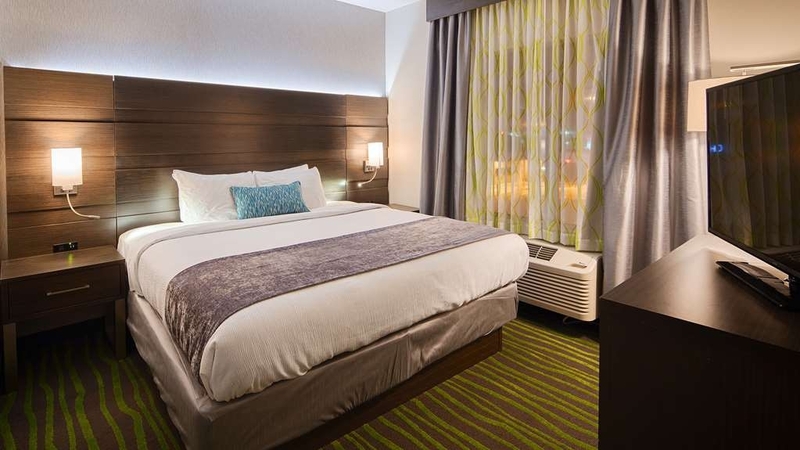 Nothing like sleeping away from your home bed, but having the comfort and security at a Best Western Plus. Great complimentary breakfast and amazing staff. Normally, i would stay at a nother property when visiting family. However, the last couple of visits was a disappointment. I decided to try the bestwestern. The hotel is new, only 5 months old. I found it very comforting and welcoming. The facilities are very nreand unworn. Our room was on the 2nd floor. We did not hear any noises below, the side or above. The room was clean and only showed very minimal wear. With two queens, the beds were comfy and the space in the room was spacious. I love the lighting in the bathroom and the biggest plus of all was direct tv in each room. I was excited to know that i did not have to pull out computers and dvd for my son to watch Disney jr an i was able to enjoy cable tv as well!! My hope is that they continue to work hard to keep the hotel up. We are delighted that you found our hotel and were able to make the change to come stay with us! 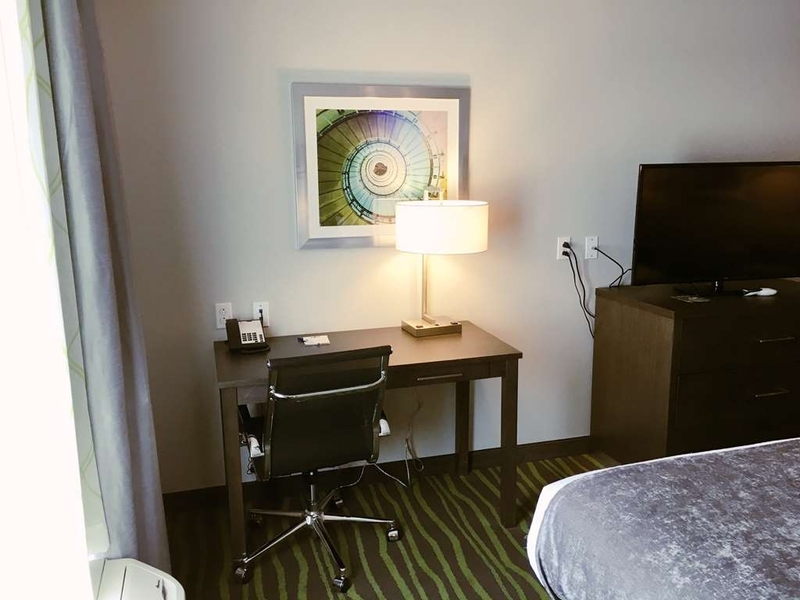 We sure hope that your continued stays to our brand new Best Western PLUS Prien Lake Inn & Suites hotel are just as great. It is very encouraging to our staff to read reviews like this and we appreciate that you went the extra mile to tell future guests all about our amenities and features. Thanks again, and we look forward to your return visits when visiting your family. Very Very nice. Employees are very friendly and call you by name. Really helpful on anything you needed in all depts. House keepers were friendly as well. Beds are really comfortable, and every thing is very clean. Love the colors of this property and decour. I do recommend this property to any one traveling, Very quite and have every thing you need. Great to hear! Thank you very much for your review and for staying with us. We appreciate your comments. everything seem upgraded and new. They were nice enough to let us use the pool and the gym late at night. The only downside is that the sheets of one of the queen beds smelled like sweat! That is why I am giving this place a 4 star. But the girl in the front desk was very nice to us and helped us out. Thank you, we are very happy to hear that you enjoyed your stay. We are sorry to hear about your sheets and glad to know it was indeed taken care. This was my first time staying at this hotel.The desk clerk told me it had only been open for four months. I was really impressed with all the new,very fancy modern accents thru out the hotel and rooms. Awesome, we are glad you enjoyed your stay! We appreciate you telling others about your stay, and hope you will return in the future. When we are in Lake Charles we usually stay at the Golden Nugget, but because it was a holiday we couldn't get a room so we opted for this hotel. I am always leery of "motels", but I will have to say this turned out wonderful. The hotel was very clean, lobby was nice & even the elevator landings were very nice looking. The room had everything we needed & the bed was quite comfortable. I will say that the staff did everything they could to accommodate us - particularly Whitney at the front desk and Heidi - who seemed to be everywhere! The bathroom was a little tight, but not bad. The breakfast was good & even though they had a full house, they managed to keep bringing out more eggs, bacon, waffle batter, etc. The only thing that was not great was the orange juice - I think they need to add more concentrate, BUT all in all it was a very good place to spend the night. "Friendly staff & Clean Rooms"
We checked in late. We got to the room to settle in. The smoke detector was issuing a warning sound. It was repeating the phrase low battery repeatedly every 20 seconds. I called the front desk, she came up to the room and replaced the battery. 30 seconds after she left the detector began again. I called the front desk and she returned right away. After it was reset it stopped. We were very satisfied with the timely manner in which it was taken care of. 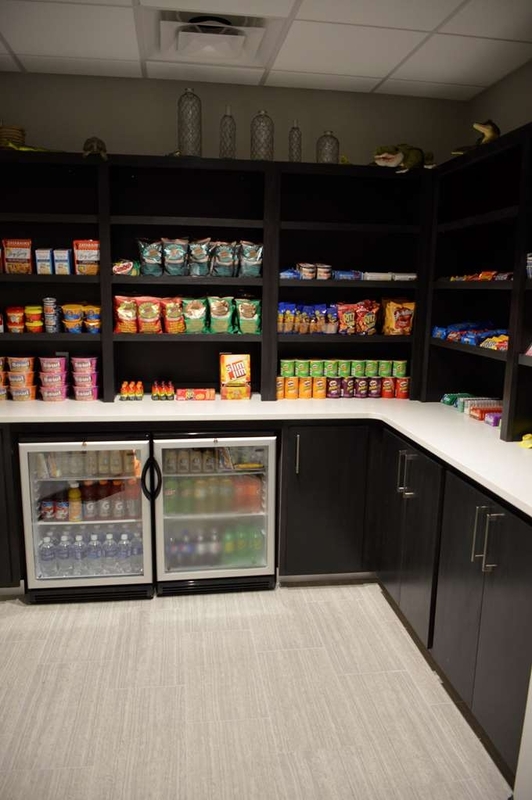 Room was comfortable, breakfast is normal buffet fare, desk clerks helpful. New property in Lake Charles, not directly adjacent to casino area, but definitely not too far away. The décor is modern, the color scheme and furniture are appealing, and there is an indoor pool. Thank you for your review of our hotel! We appreciate your kind comments and honesty. We do hope that you will return in the future and choose to stay with us. We stayed here for one night as part of our U.S. trip. 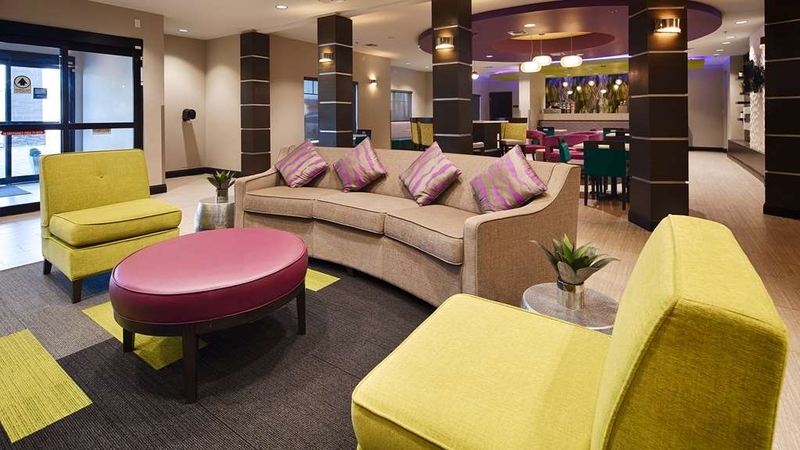 The hotel was beautiful, very contemporary, modern with lovely bright colours and very well thought out decor. The bed was really comfortable and we all had a good nights sleep. It was in a nice quiet area. Breakfast was adequate with a good selection of things to eat and drink. We would definitely stay here again and would recommend it. Awesome! Glad to hear it, Thank you so much for your kind review and for choosing to stay with us on your trip to the U.S.A we hope to see you in future years during subsequent visits to America. My family of five stayed for one night. We got two rooms, one with two beds and another with one. As soon as we walked in, we were blown away by how trendy the hotel was. The blue, green, and purple theme was very pleasing and appealing. 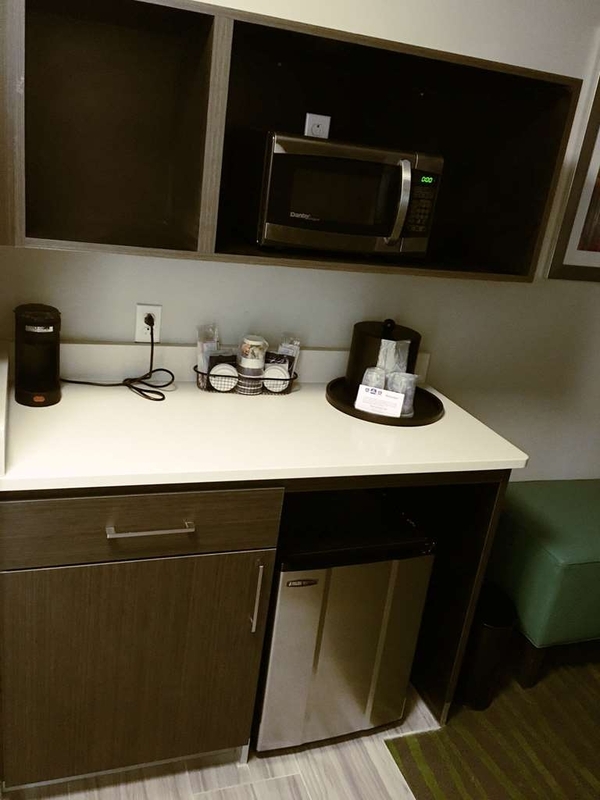 The rooms were equipped with a microwave, refrigerator, and coffee machine. The rooms and bathrooms were very clean. Another detail I enjoyed were the little reading lights they had by the bed. My favorite parts were the fitness center and pool. It was all a very spacious and enjoyable and open for a good amount of time. The staff were also very kind to me when I asked them a lot of questions. 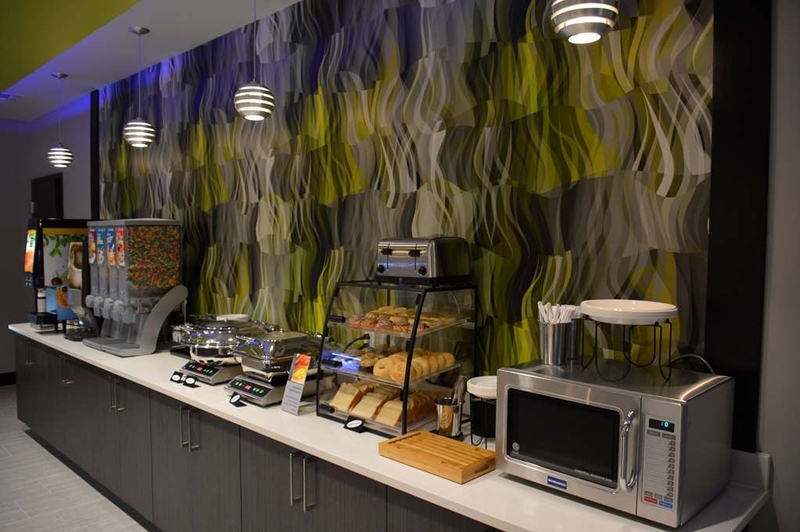 Unlike many hotels, this one offers vegan and gluten free options if you ask them. Unfortunately, I asked for some almond milk and they had just run out. The attendant on breakfast was very nice and offered I grab some for me from a near by store. Definitely will be staying again! 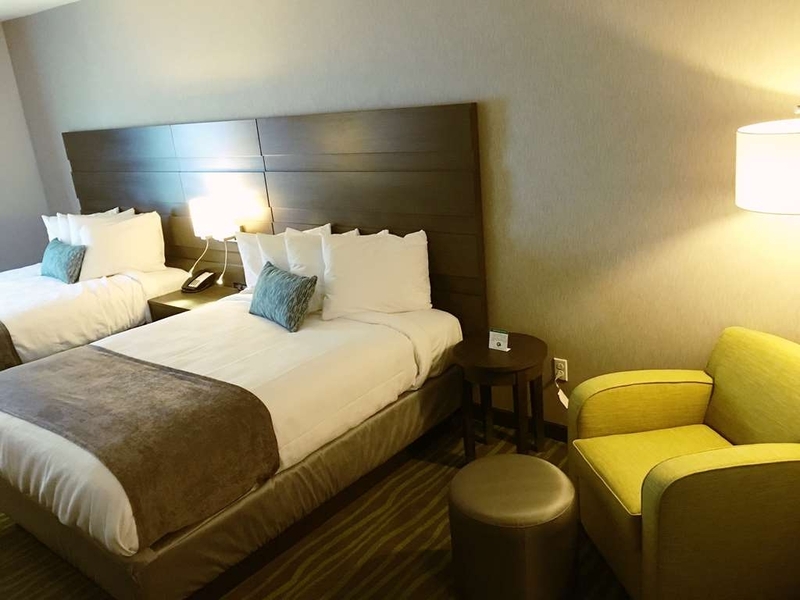 The room was clean, staff was very helpful. My daughter had surgery and they let us in the room early and was very accommodating. I would recommend the Best Western Plus Lake Inn and Suites, Lake Charles, Louisiana to everyone. "New Hotel with new feel"
Very nice Hotel. Very clean. Open only 3 months. Has "wet dog" smell in lobby. That was only turn off. Breakfast was very good, it included eggs, bacon, sausage, several breads, fruit, juices, and yogurt. Thank you very much for staying with us and for letting others know how great your stay was! We are thrilled you enjoyed a good breakfast while our guest, and apologize for the wet dog smell. "Baseball Youth World Series 2016 "
Third party bookings over booked rooms that weekend. Hotel staff accommodated our entire baseball team. The staff went above and beyond to ensure our stay was pleasant. I highly recommend this hotel as it was very clean! Breakfast was awesome and the rooms were spacious if you book double beds. The manager, Jonnique Ceasar was very professional and friendly. The staff, Brittany, and others provided recommended nail spas, restaurants and shuttle to casinos. Overall, our stay was awesome and highly recommend this location! Great to hear it! Thanks so much for staying with us and for letting others know how enjoyable your stay was. We look forward to your return next year for the World Series. "Very nice, new and great staff"
Our last stop on the way home to Austin, we stopped here to take advantage of the current BW "stay twice, get a $50 Travel Card" and because Lake Charles has some good Cajun restaurants. The friendly, professional desk attendant, Santana, had us on the way to our room in short order. The room, 403, was superb. Large, clean and cool. Simply put, it was great! A good night's sleep done on a comfortable bed had us ready to partake of the breakfast and hit the road. Our morning meal was just fine. We did have to wait for some bacon to be prepared but the wait wasn't that long. Standard BW breakfast fare but still it was included and tasted good. Check out was easy, fast and professional. This is a newer, very nice place to stop. Great to hear! Thanks for staying with us and for letting others know how great your stay was. My husband travels ALOT for work so he stays at so many hotels and when possible me and our kids travel with him. We have never stayed at a Best Western, but with this being a new hotel we decided to give it a try. We ended up being very disappointed. The first morning we woke up at this hotel there was a very, very large roach in the toilet. We were a bit confused being that we are on the 3rd floor and this hotel was 8 weeks old at the time. The housekeeping crew is incredibly subpar. It seems they are lazy and don't care about doing their job. Me and the kids are in the hotel most of the day because my husband has the car for work and it is too hot to walk anywhere and there isn't much in walking distance. The housekeepers will knock on the door and ask if we need anything I simply ask them for new towels and to empty the trash. They don't offer to clean the room entirely or even replace the bars of soap or shampoo/conditioner bottles. One day our room was skipped completely, not one housekeeping member stopped by to offer their services, empty our trash or give us clean towels. When my husband got home from work he had to go to the front desk and ask for someone to bring us towels and empty our trash. With it being the kids and I during the day we don't make it down to breakfast in the morning but my husband says they're usually out of things or not stocked as it should be. He leaves for work shortly after 6am when breakfast opens. He has said that at that time they were out of bacon and cream cheese, one morning they were out of regular coffee. The one day when he was off work our family went down for breakfast. The woman who was taking care of breakfast seemed irritated and overwhelmed to keep up with breakfast. People were forever waiting on eggs. I got toast for my daughter and reached my hand in the container of jelly packets and it was terribly sticky and a mess. The staff seems too lazy to keep up with simple tasks of cleanliness. My daughter had to use the restroom while we were at breakfast so I just took her to the one in the lobby, she wouldn't even go to the bathroom in there because it was a terrible mess. Not to mention the one morning we did make it to breakfast we saw yet another roach in the breakfast area. My husband asked the lady at the front desk what kind of bug it was and she confirmed it to be a roach. The one day my husband was off work and we all went out for the day, particularly so the housekeeping crew could come in and clean the room entirely. Well, the sheets on the bed were not changed and the bathroom was not cleaned.....I'm not really sure what they did that day. Another disappointment was that the pullout sofa had no bedding for it and the pillow for it had no pillow case. Furthermore, I became frustrated with this hotel, especially after a strange man was pacing around our room one night. So the next day I just put the "do not disturb" sign on because I just didn't feel comfortable with it just being myself and 2 kids. Well, even with the do not disturb sign on the housekeeper just opened our door and walked right in.....she did not even knock! I mean the do not disturb sign was hanging on the door and without even knocking she just opened the door and tried to come in! She did not even acknowledge or apologize but rather just shut the door and left like nothing happened. That was the second time that happened to us! But the first time the do not disturb sign was not on but still they don't even knock they just open the door and walk in.....needless to say I keep the door double locked when I am here with the kids. I do not trust this place and I am starting to feel uneasy here. I am anxious to check out and it is safe to say we will never be staying at a Best Western again. We are sorry as well! Please accept our humblest apologies for the details for your stay and know that changes are underway to remedy this issue. "Nice, new property but housekeeping had some issues, and the breakfast was not well stocked." Toilet in room was not flushed and cleaned. It appeared as though someone had not finished their cleaning or stocking with washcloths. No waffles in breakfast area. The hotel is very new, and comfortable. And front desk was awesome. We are so sorry that you had to experience this. Please accept our humble apologies and know that this has been discussed with our housekeeping staff. Thank you for letting us know. 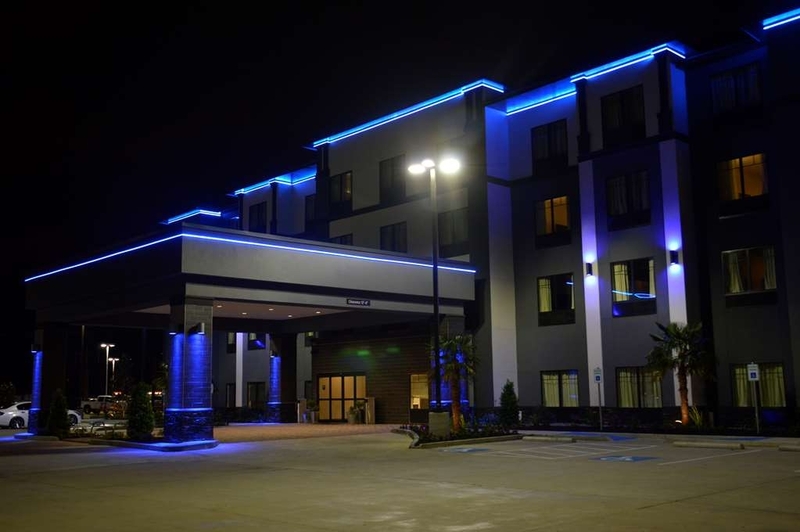 "Like a ghost town..... "
My family visited this very new Best Western 2.0 on a Thursday night. Our party of 6 was 6 of the 12 guests at this hotel on this particular night. It was almost creepy it was so quiet. The night hostess assured me that it was usually hopping on the weekends. 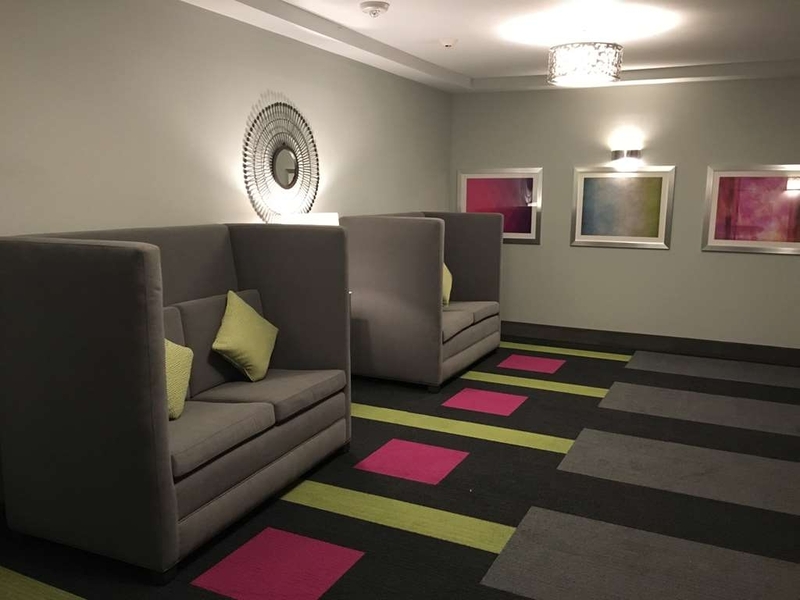 The lobby was furnished in a fun, spunky style. The breakfast area was incredibly nice as well. It had an indoor pool that my kids used. I did prop open the door to the pool area as the chlorine level was so strong in the air that it burned my eyes. My children said the pool was ice cold. Our room was basic and appeared clean. I loved the bath and body works brand bath products. The one thing that really bugs me about many moderately priced hotels is that they do not fold their sheets after being dried. This creates these sheets that are soooooo wrinkled that they appear as though they have been slept in before. This creates so much anxiety in me when I think my sheets aren't clean. This new best western has these types of sheets. Mine looked like they had been slept in but I HOPE they had not! :-) The one negative that I can definitely tell someone about was the nasty refrigerator. When I tried to put our water in the small refrigerator, my hand first stuck in crumbs and nastiness IN the handle! When I opened the door, the inside was filthy with Lord knows what! Bleeeck!!!! This may be a newer hotel but it won't stay busy long unless they start cleaning things more thoroughly. Breakfast was good with various meat items and a nice variety of cereal. There's not much around to eat within walking distance as this hotel is in the middle of an older(1960-70's) business district. Thanks you for bringing the details of your stay to our attention. We apologize for all the little details that meant a lot during your stay. Please accept our apologies and know that we are working hard to remedy these. We hope you will give us another opportunity to host you in the future. 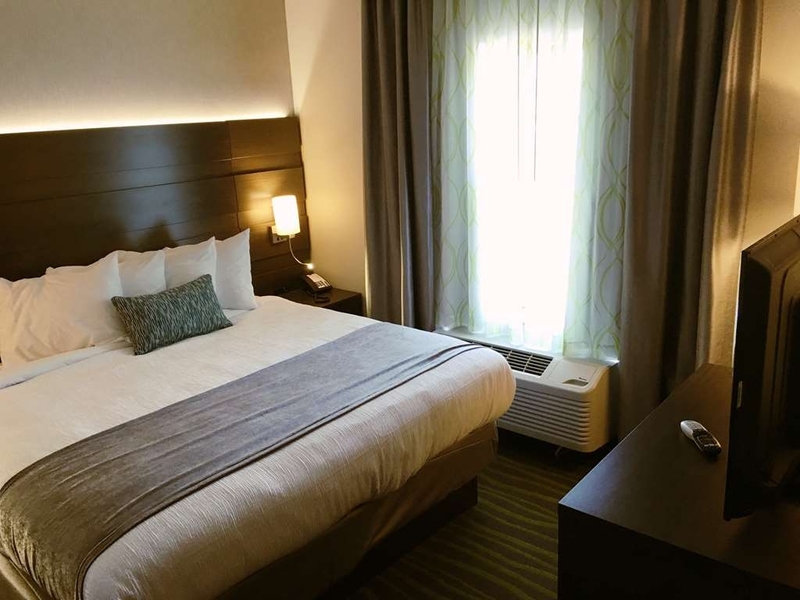 This hotel is in a good location, close to food, shopping and not a far drive from the Casino. the beds were very comfortable and the room was a very nice size. The breakfast was decent, it was a hot breakfast, but it certainly wasn't the southern cooking promised on the website. The staff was very friendly. The pool was indoor but it was freezing. People were very loud in the middle of the night when they returned from their outings. I would stay here again, because of the cleanliness and staff professionalism. Thank you for staying with us and for letting others know about your stay. We apologize that breakfast did not quite satisfy you and that other guests were a noisy in the late hours. We hope that you will give us another opportunity to host you in the future. Thanks! 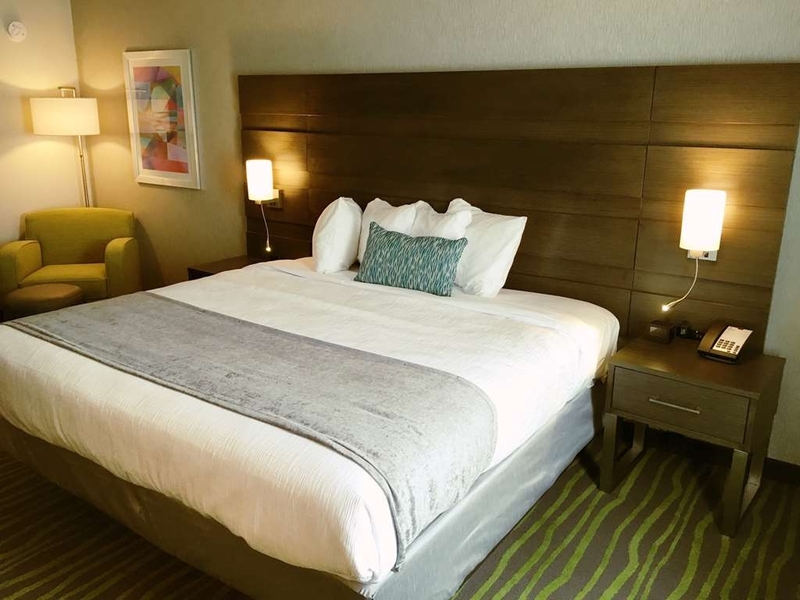 I would have given five stars but there was one issue we had which I address in my next paragraph .The staff was amazing & The hotel is super clean . I was concerned about road noise when we checked in on that busy street but we had no issues . I didn't even hear any sirens which I usually do when I've stayed in Lake Charles at other hotels. My only issue was an strong odor in our room from the moment we walked in . I mentioned it to the front desk & they were already aware of the problem & attempting to correct . My husband thinks it is possibly the new furniture smell , but they said the issue will be addressed again after we left . The odor did make both my husband & I sick with sinus & allergy drainage which we didn't have before checking In . I suggested they attempt to correct it with an ozone turbo machine as some hotels have used with allergens before . As I said the night staff (both ladies - they had a staff change shortly after our check in ) & everyone on day shift were so friendly & very polite . I would like to see vending machines & ice located closer to the ADA rooms than the next floor up. I thought the room was higher than I normally pay for a Best western but I realize that the casino markets drive the prices up even for those of us not going to a casino ! But room was very clean & staff was top notch ! Thank you for noticing how super clean our hotel is and how there is no road noise. We are thrilled to know you enjoyed your stay and apologize for the odor, thanks for bringing it to our attention so that we could get it taken care of immediately. We hope you will return in the future for an even better stay. Thanks again! "Brand New Hotel and it shows"
We were only in Lake Charles for one night buying a classic car so needed a place to stay. 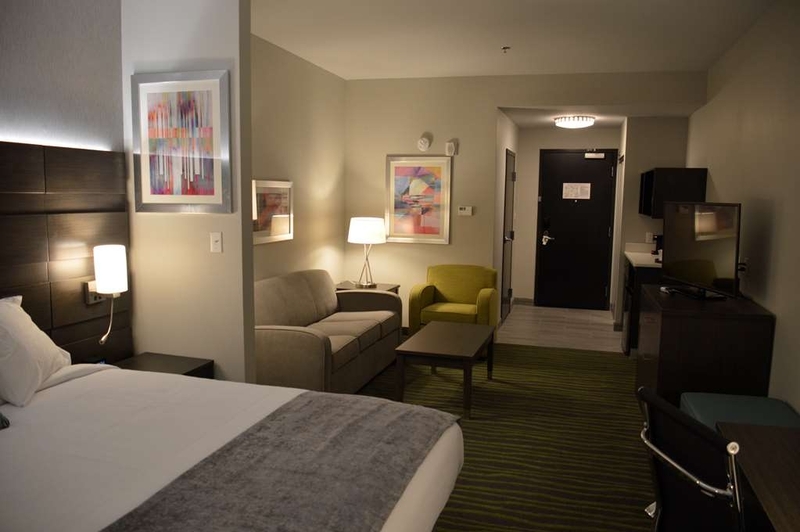 Because of the Casino's and limited number of rooms, prices are high all over the city. We chose the Best Wester Plus partially because of the reviews here on Trip Advisor, and partially because it was Brand Spanking New. The hotel was clean, comfortable and (as expected) brand new. The hall ways still smelled of paint and new carpeting and the guest rooms were in showroom condition. Location was good and it was easy to get to and get out of. The staff was friendly and efficient. We made use of the small but well appointed gym while we were there and I honestly think we were the first people to use the machines. The only down side was that the breakfast area smelled .... well, odd. If I had to put my finger on what it smelled a bit like wet dog. Not very appetizing. Overall we had a good experience and I wouldn't hesitate to recommend this property. Thank you so much for staying with us and for giving others a clear picture of what our hotel has to offer. You may not believe this but those machines have been used daily. It is amazing to me how much the facility has been used. We will look into the breakfast area odor and appreciate you pointing it out. Thanks again, we hope you enjoy your "new" car!! We look forward to your return, maybe for a car show. We stopped here for one night. 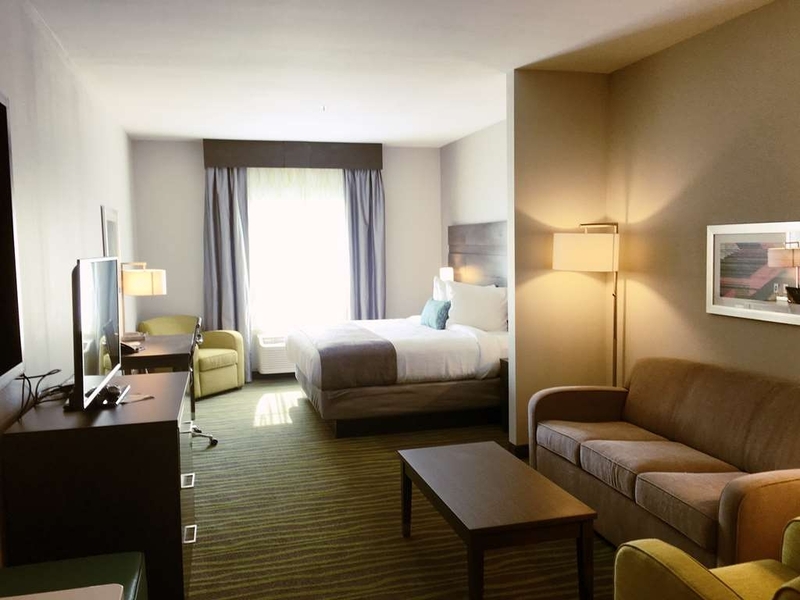 We have just discovered the Best Western Plus properties & really like them. This is a new property in Lake Charles. Location is right off of 210 & very easy to find. The staff were great & very helpful. Rooms needed some work, but that was due to the shoddy workmanship of the builders. One of the USB wall plugs was already falling out of the wall. I told the staff on check out & I'm sure they've taken care of it. The rooms are nice & big, beds are very comfy so overall it was a good stop. My only other issue is with the temperature of the fitness room. Not sure why they feel the need to keep it set at 80+ in the room! We were able to set the temp lower it but it didn't seem to go down. I would stay here again when heading that direction. Thank you for your review! We are sorry for the condition of the USB Plug in your room. Yes we have addressed the issue with that piece of furniture. 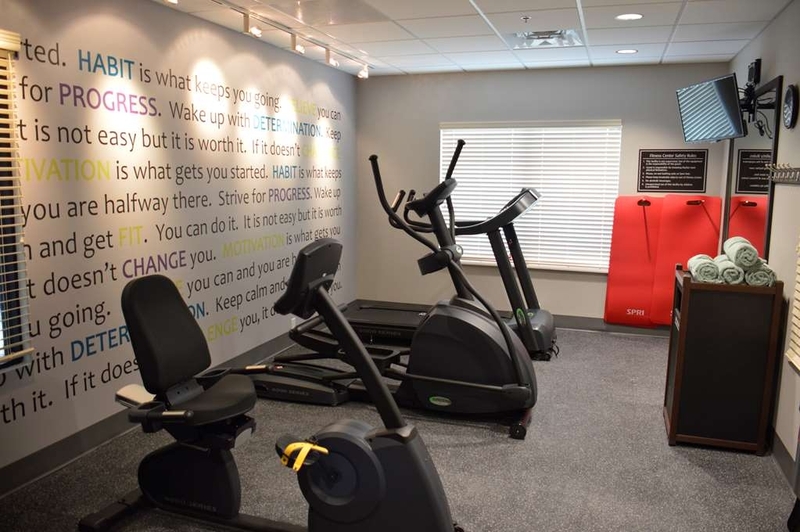 Some folks like to sweat it off in our fitness center and hike the temperature up. We lower it every chance we get and it does take some time to cool the room down. Sorry you had to experience this. We are glad that you stayed with us and enjoyed our new hotel, we hope that you will come back to see us again soon! Brand new! We were first to sleep in our room!! Staff was great! Very friendly! We wanted to go gambling and everything was booked! We got lucky booking this room??! This is a great location! The road the hotel is on....leads straight to the golden nugget and Laberge Casinos! Has a small pool indoors! Great for any time of year! 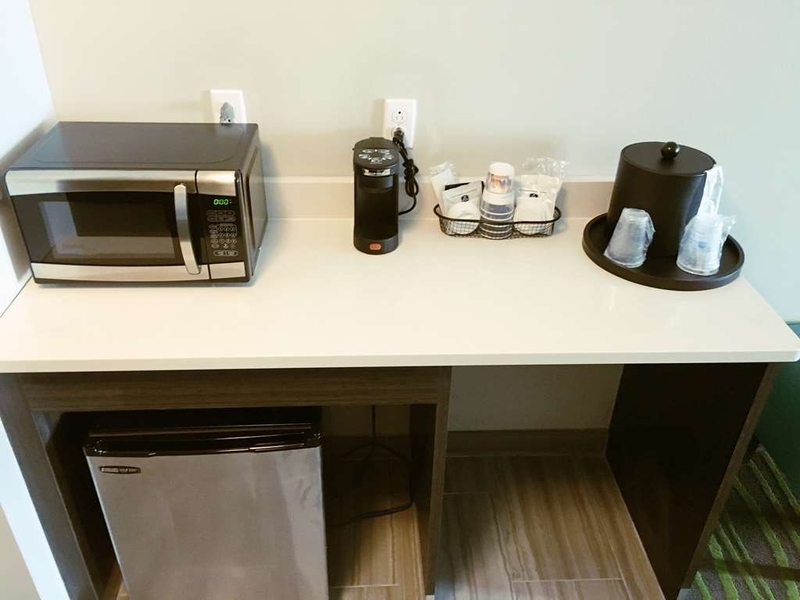 Room had a fringe, coffee pot, and microwave. I highly recommend this hotel!! Great price! Great location!